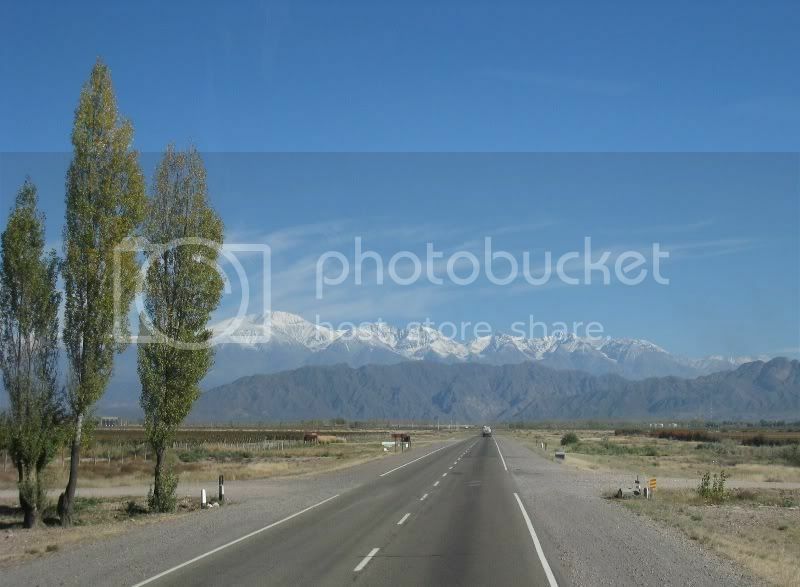 Right now we are in Peru, but here are some pictures from Mendoza, Argentina and from northern Chile before we crossed over to Bolivia. 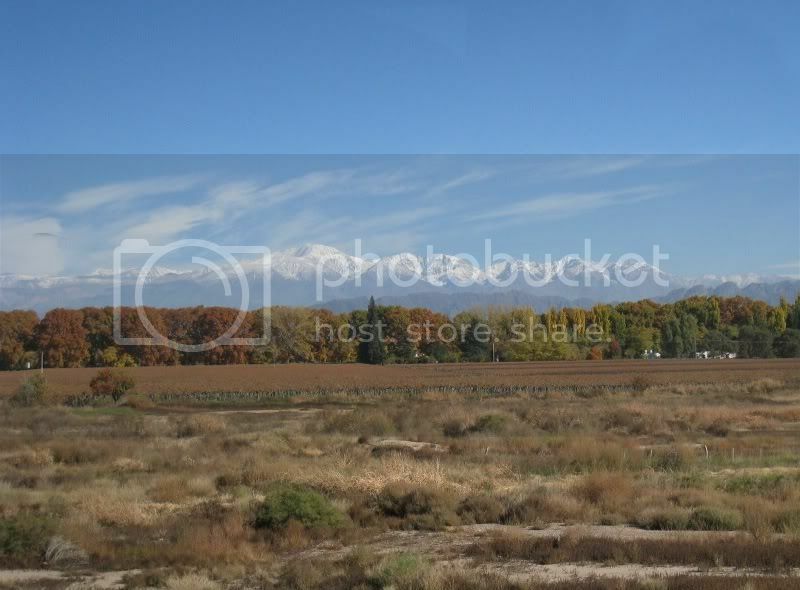 This was our first view of the mountains surrounding Mendoza when we came on the bus from Bariloche. 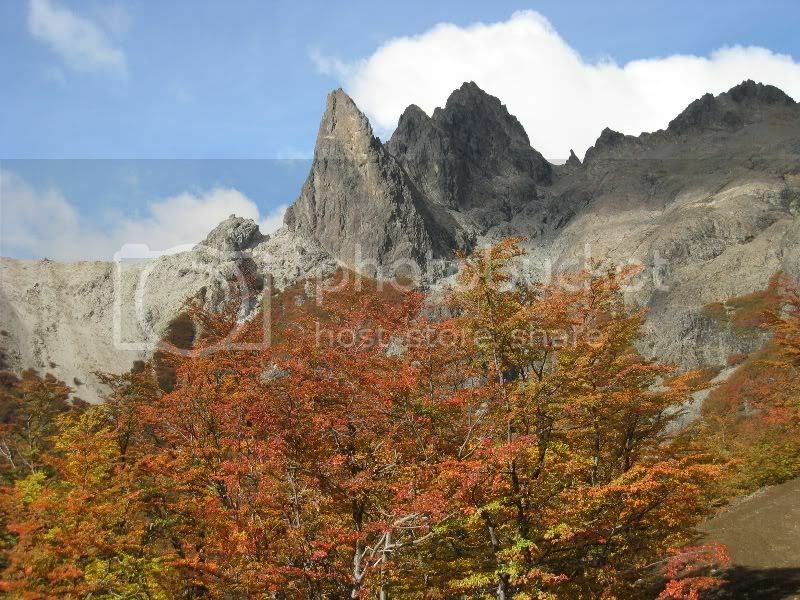 Since we were there during their autumn season, you can see the Alamo (Poplar trees) turning a beautiful golden color. The contrast of colors were amazing! 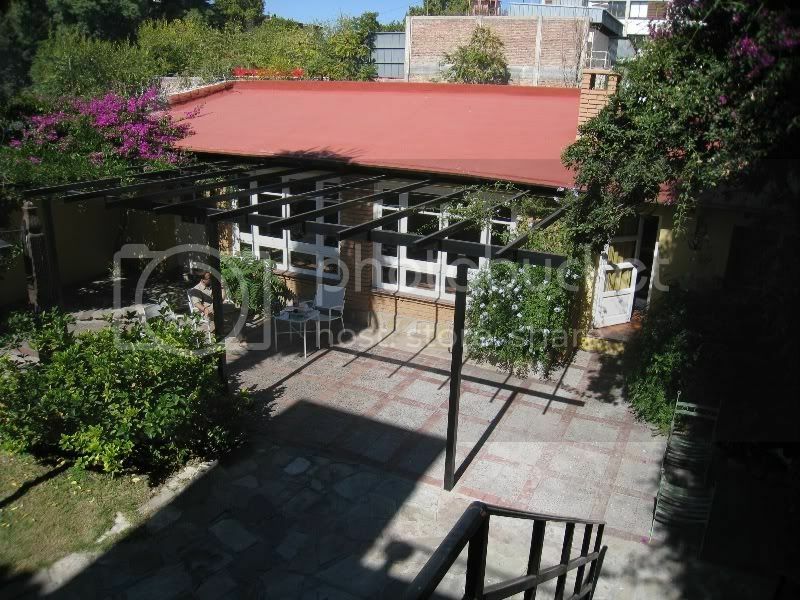 The hostel we stayed in Mendoza was called Hostel Alamo and it is the hostel that Jaya´s best friend, Mona Dizon, opened up with her former boyfriend. The location, staff, and amenities were great. We also had one of the best breakfasts in Argentina. Thanks Mona and Fernando! This is the shot of the courtyard, a great place to chill out or have lunch. 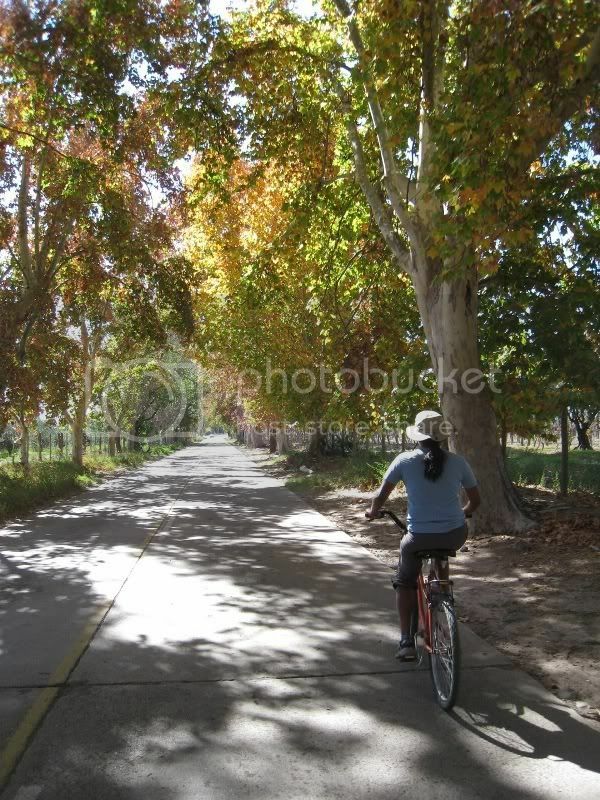 Since Mendoza is the area where Argentina´s finest wines are procuded, we had to do a wine tour but on bikes. The trick is not to “taste” too much wine! 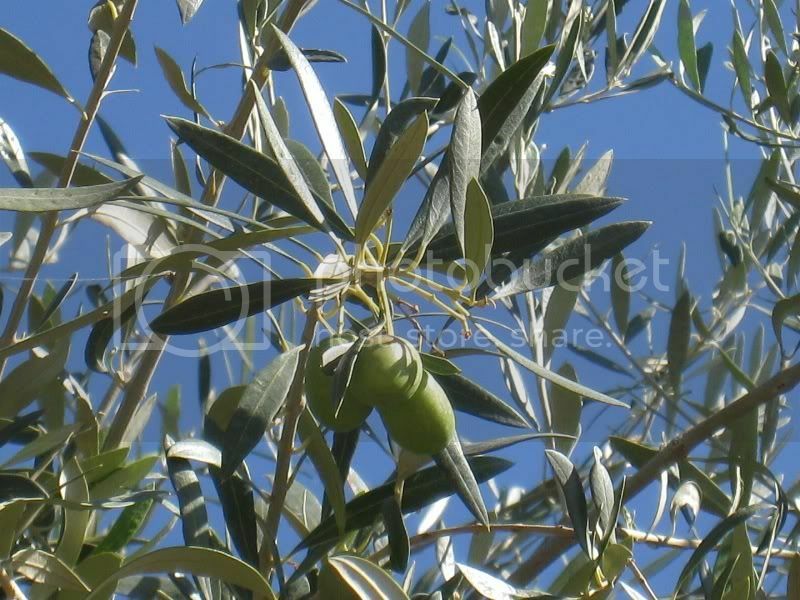 The weather that day was perfect and in addition to the vineyards there were a lot of olive orchards. 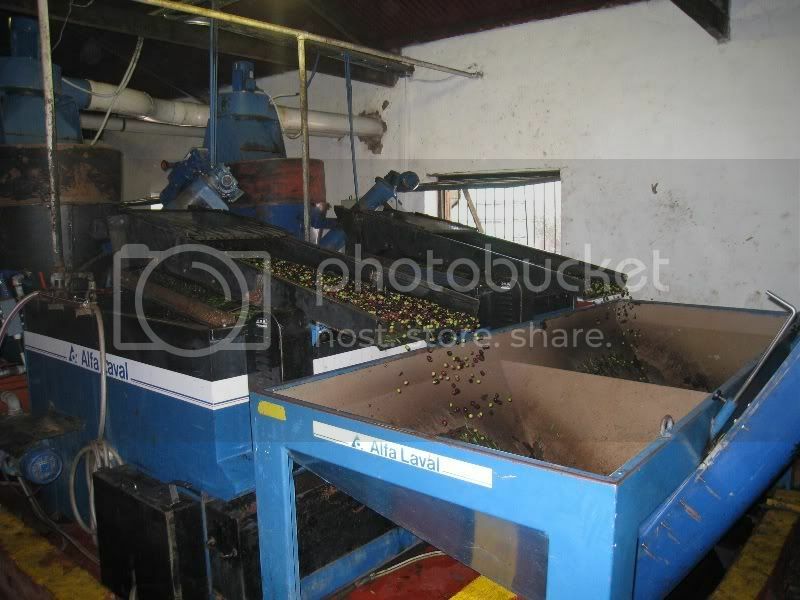 All the olives are handpicked. 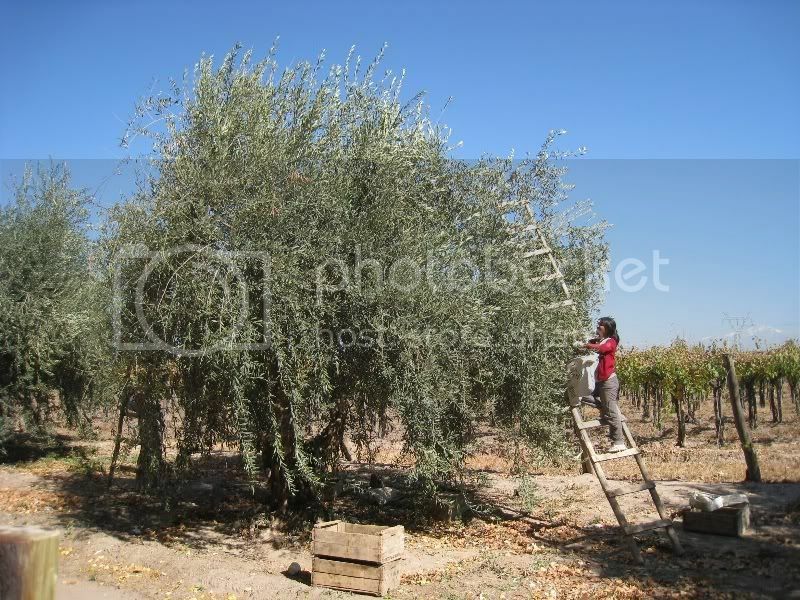 No, that is not Jaya picking the olives. 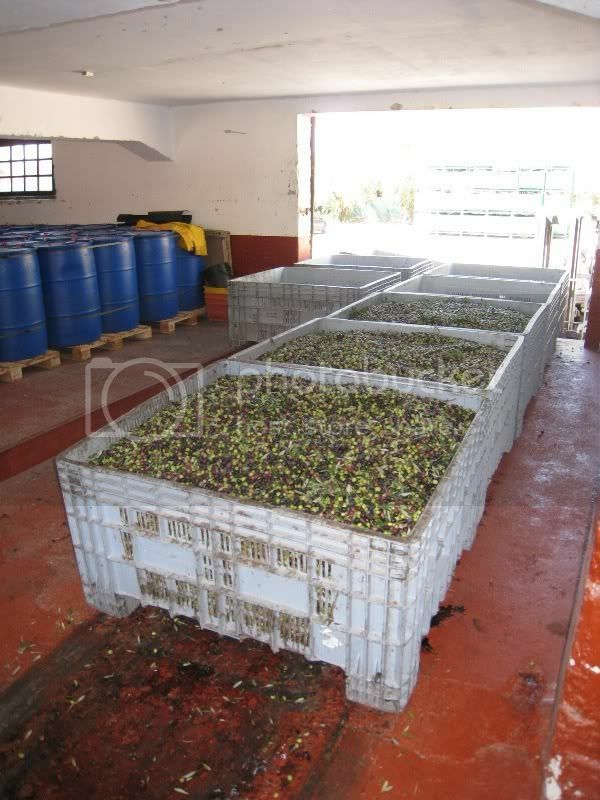 The olive factory we visited. 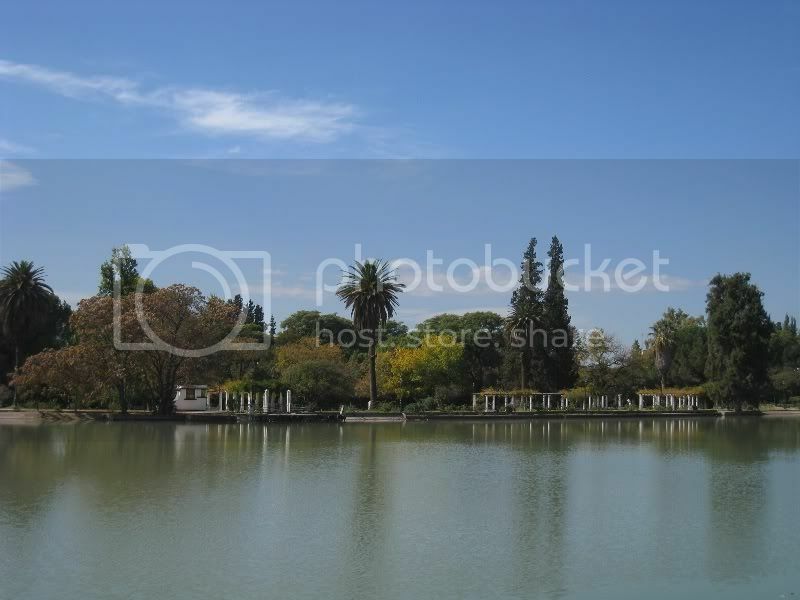 In the middle of Mendoza we found an oasis of green called Parque San Martin. 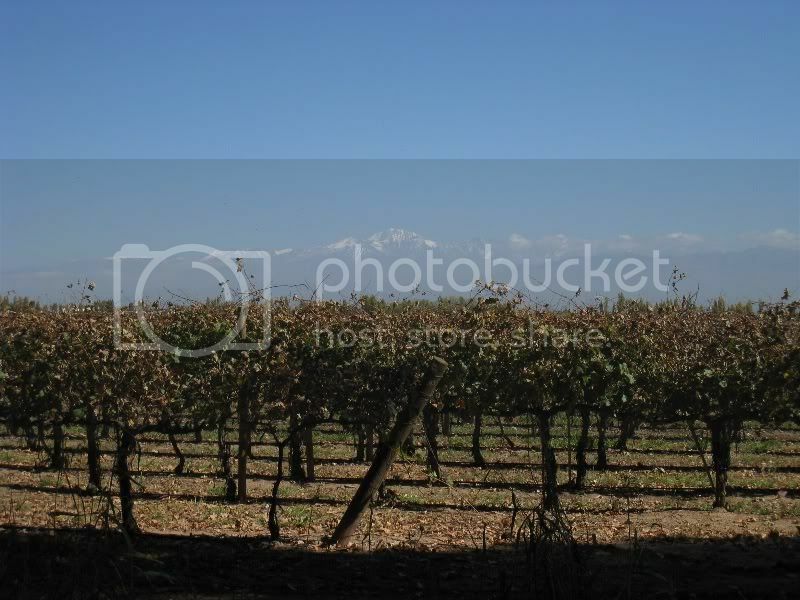 Since Mendoza has a relatively dry desert climate, all of the tropical trees were transplanted from other parts of the continent. 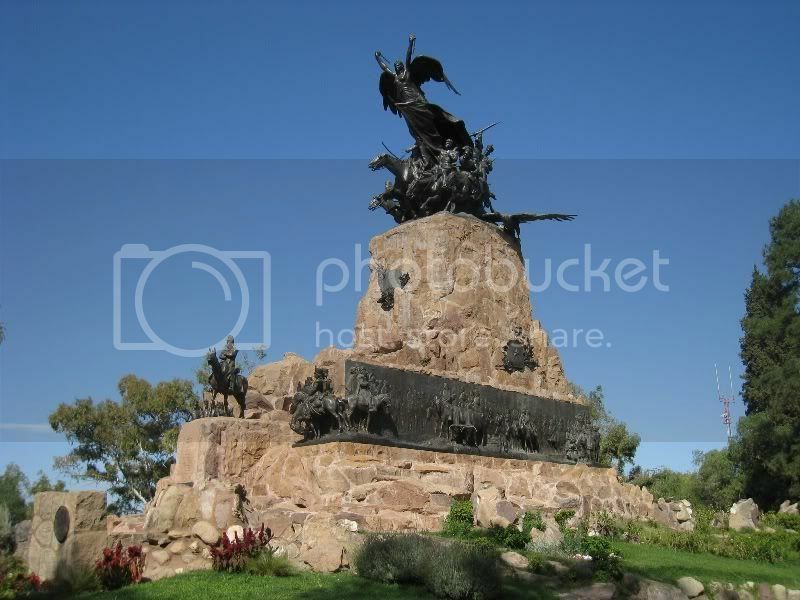 Inside the San Martin Park is located the Hill of the Glory "Cerro de la Gloria" where an enormous sculpture is set in tribute to the Andes Army. 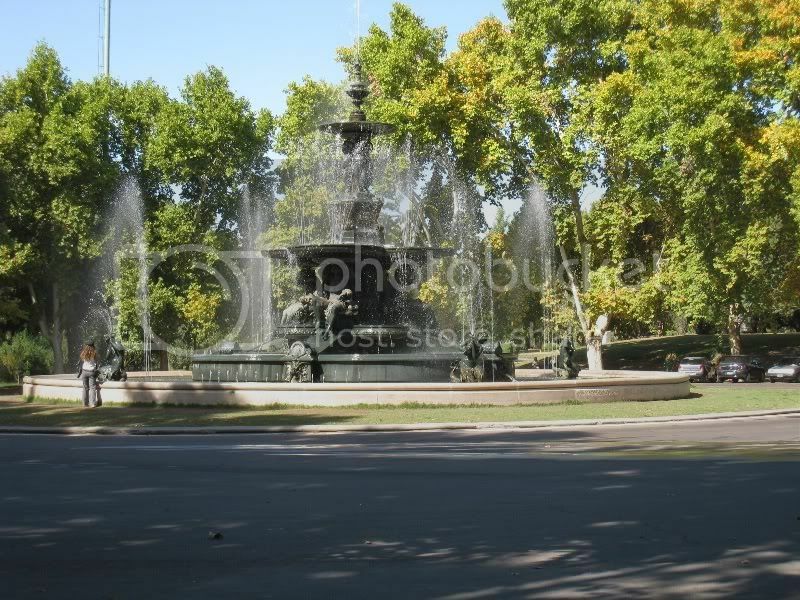 This monument stands as a permanent tribute to San Martin, his liberation army, and the magnificent feat which turned Argentina, Chile and Peru into free nations. At the recommendation of Mona we treated ourselves to a very nice dinner at Azafran. 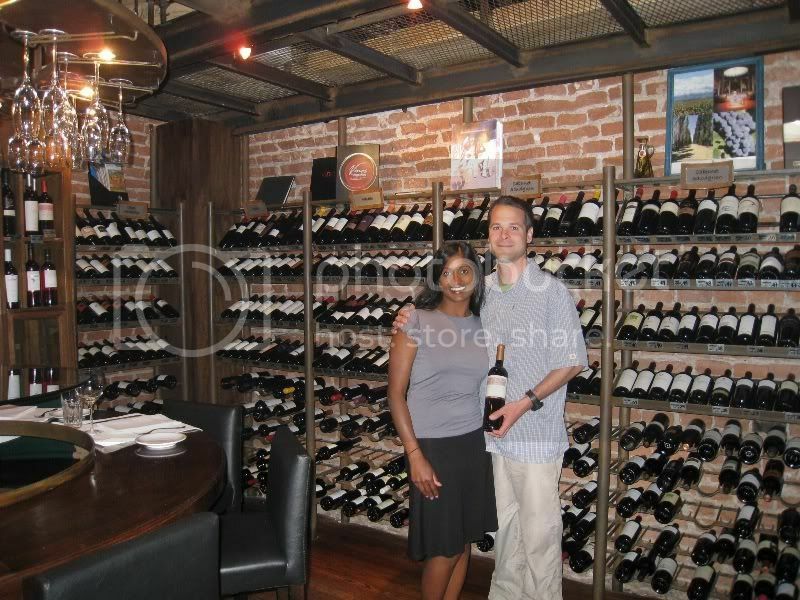 Instead of showing you a wine list, they take you into their wine cellar so you can handpick your own wine! 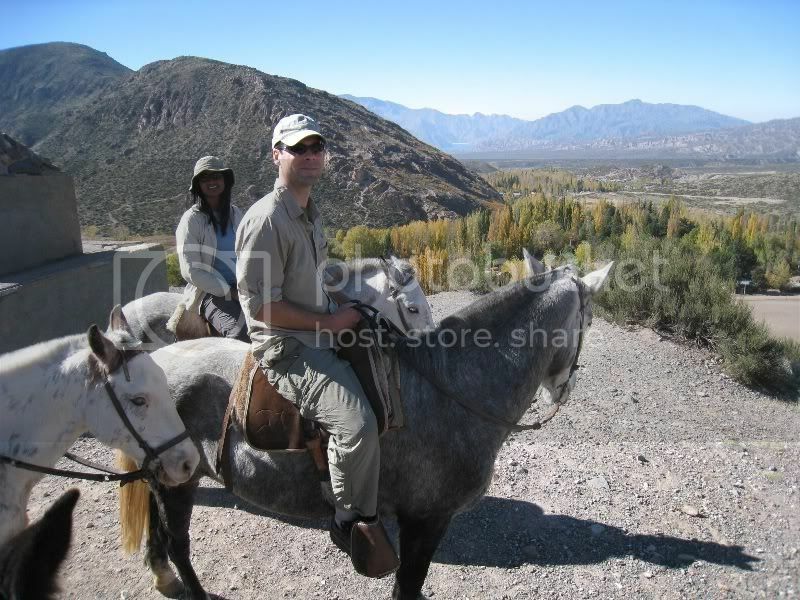 We have wanted to make a horse back riding trip for a long time and we could not pass up the opportunity while in Mendoza. Yes, that is Jaya on the horse. A beautiful backdrop and great weather to match. This was the last picture from this day with Jaya in a happy mood. Her horse lost its footing and fell forward taking Jaya down with it. Jaya got a few bruises on hip and elbow but fortunately both her and the horse are doing fine now. 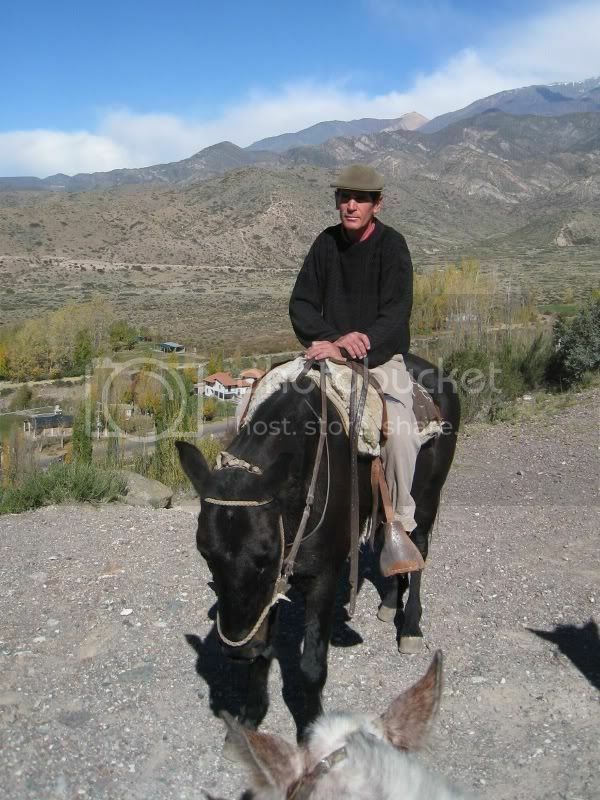 Our stay in Mendoza was too short and we had to continue our journey. Our next destination was Bolivia, but instead of just flying to La Paz from Mendoza, we took the scenic route through Chile via the Andes. 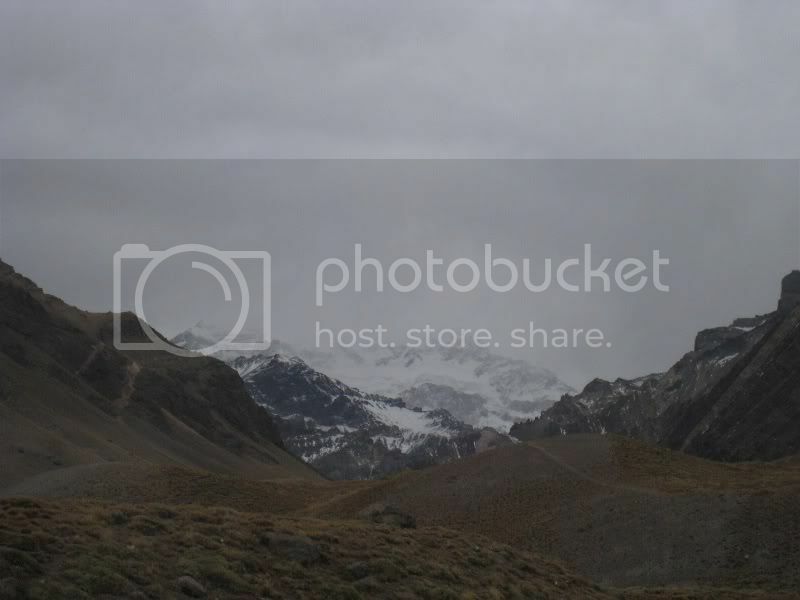 Here is a somewhat cloudy picture of Cerro Aconcagua as seen from the road to Santiago de Chile. 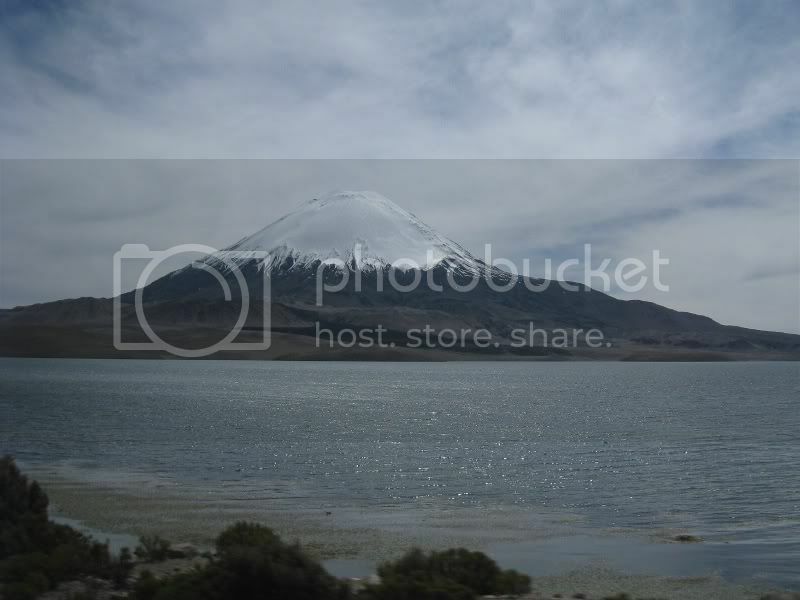 This is the highest mountain in the Americas and the highest mountain outside Asia, measuring in at 6,962 metres (22,841 ft). 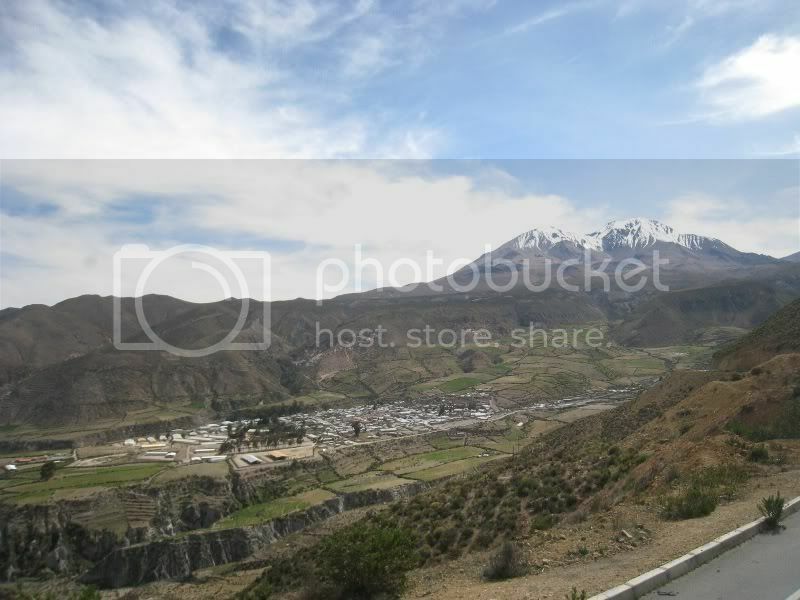 The road through the Andes was breathtaking, but it can also take your breath away. This was one of the scariest parts on the road down! 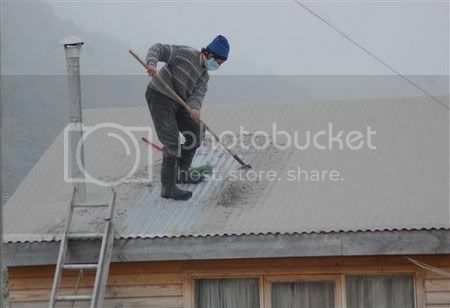 Santiago de Chile is infamous for its smog. The one (and only) positive thing about this is however that it can yield a magnificent sunset. 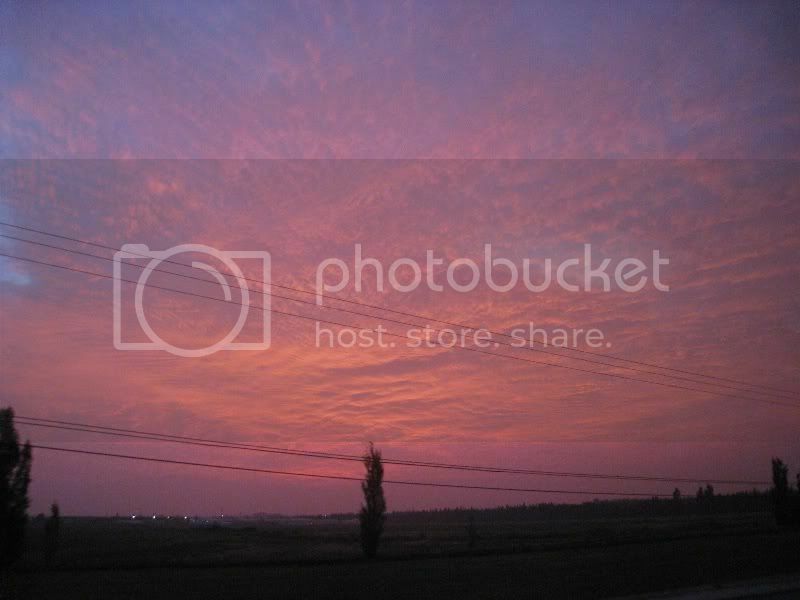 We have never seen such a red sky before. 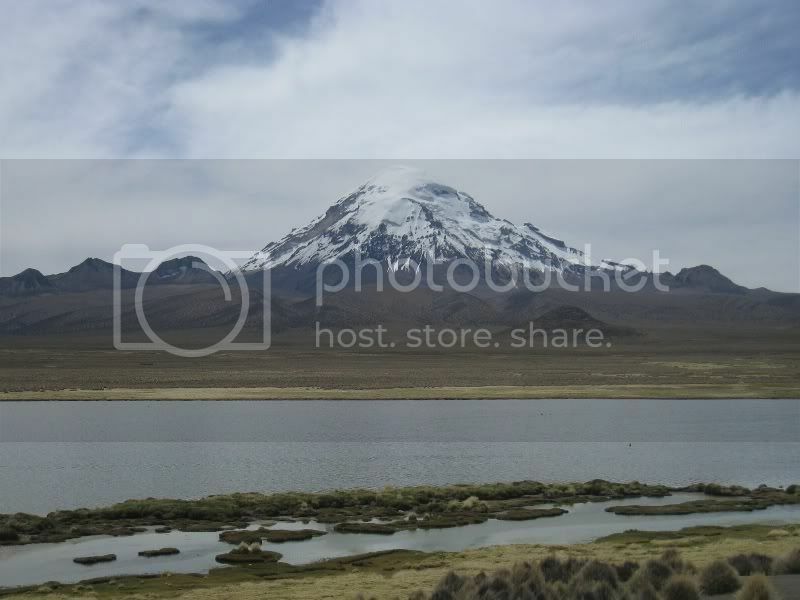 In order to get into Bolivia, we took another scenic bus ride from Arica to La Paz through the Lauca Nationalpark. 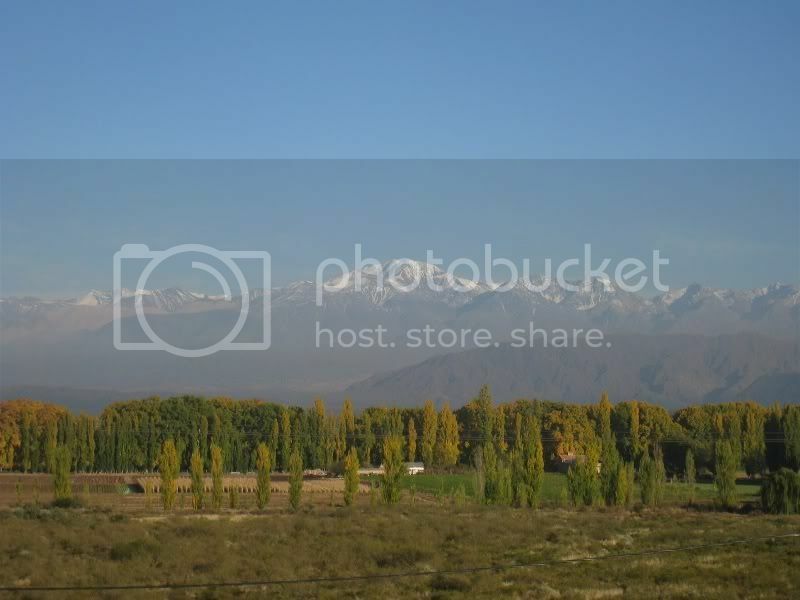 This is the town of Putre in Chile and you can see the snow-capped volcanoes in the background. 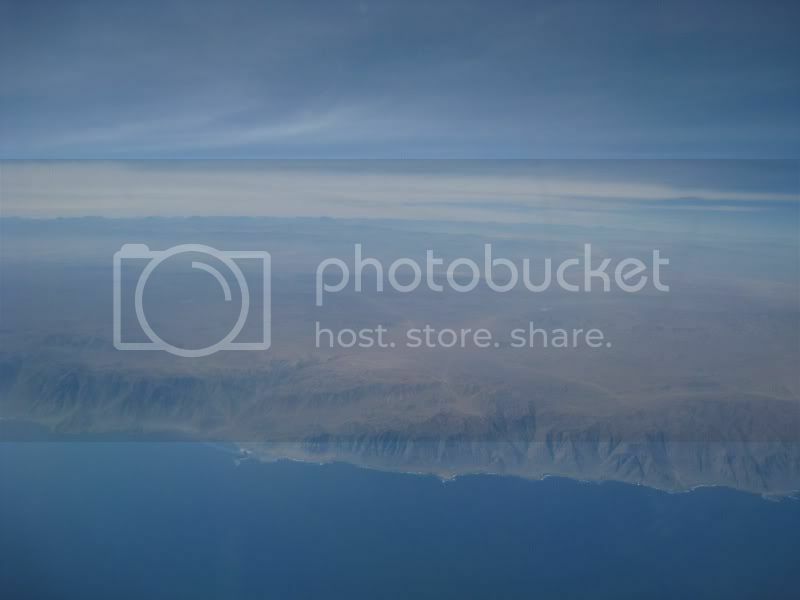 When we landed in Arica we were at sea level and as our bus drive to Bolivia lengthened, so did the altitude! 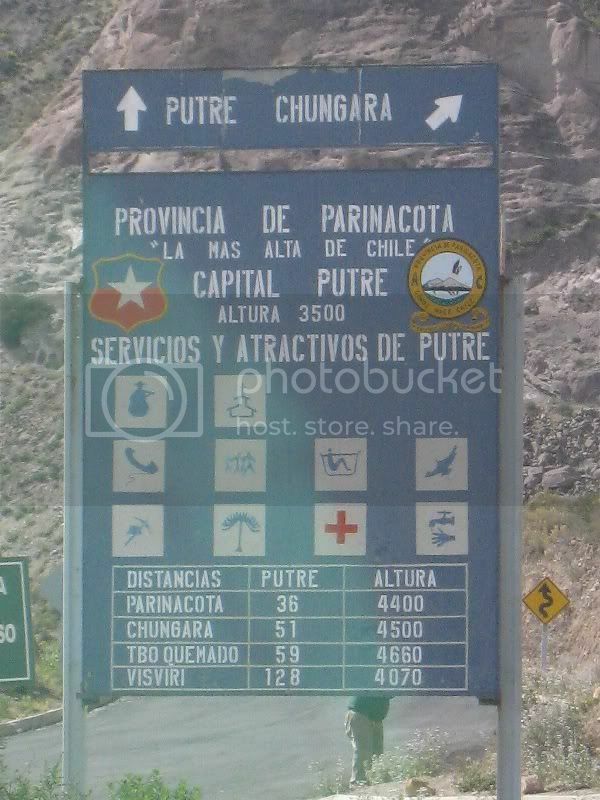 We went from sea level to a mountain pass at 4600 meters and down to La Paz at 3500 meters in a matter of a few hours. Oliver did not take it too well and had a pounding headache for a day. 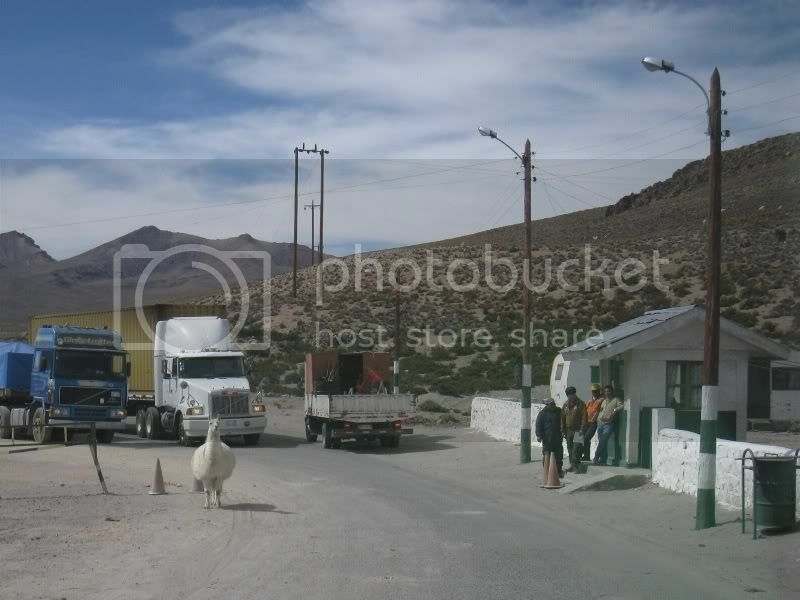 As we approached the Bolivian border control we had a friendly Alpaca greet us at the crossing! 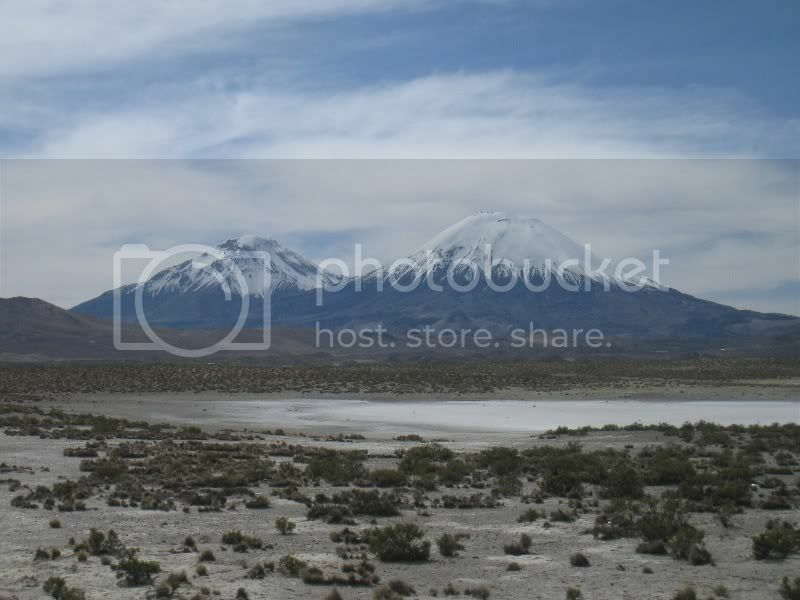 More about Bolivia on our next post! 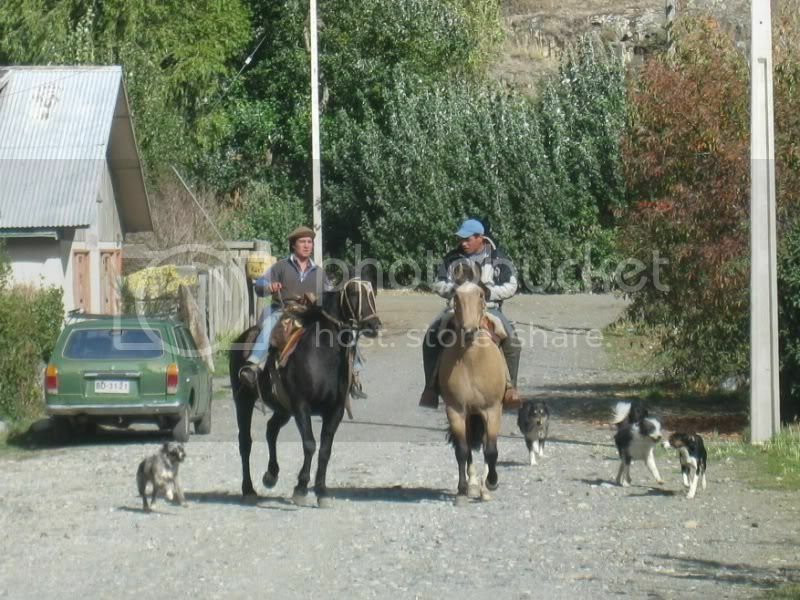 In Chile Chico we crossed from Argentina back into Chile to do part of the famous Carretera Austral (=Southern Highway). 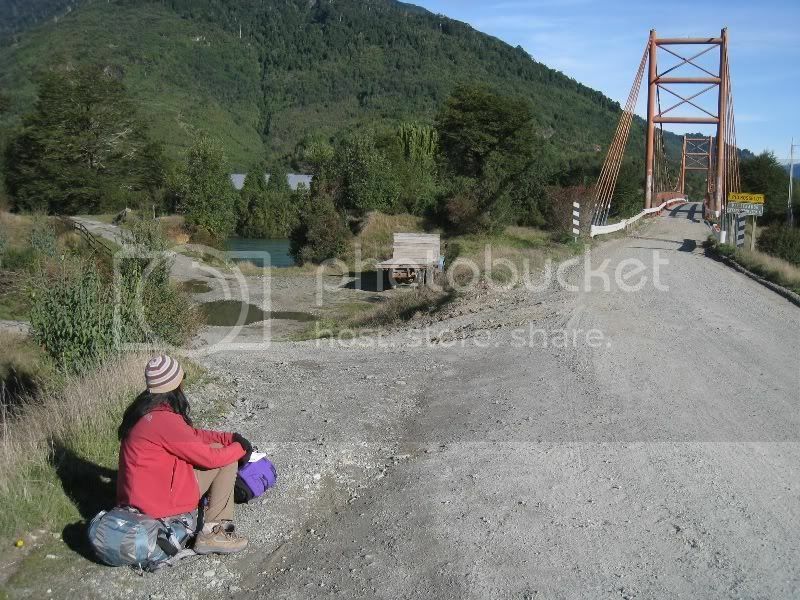 This highway runs more than 1200 km from Puerto Montt to Villa O´Higgins. 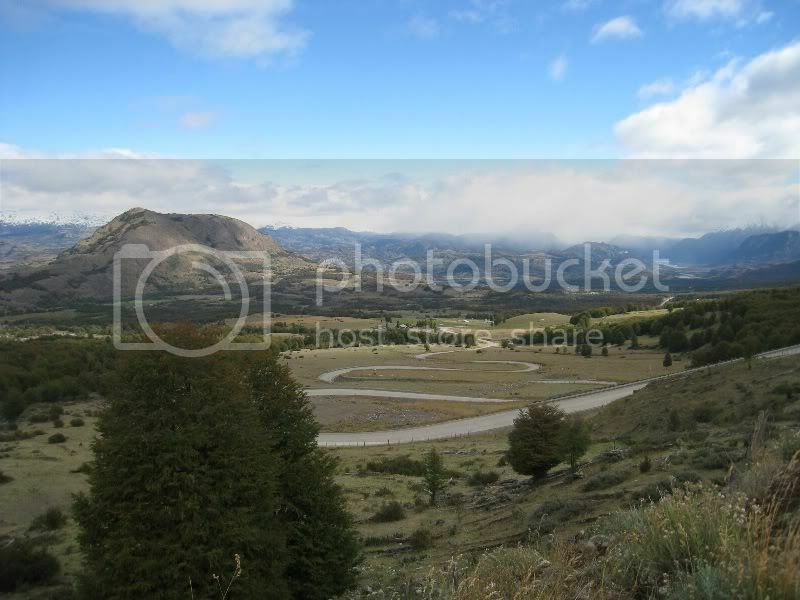 It is a mostly unpaved road and it runs through some spectacular scenery. 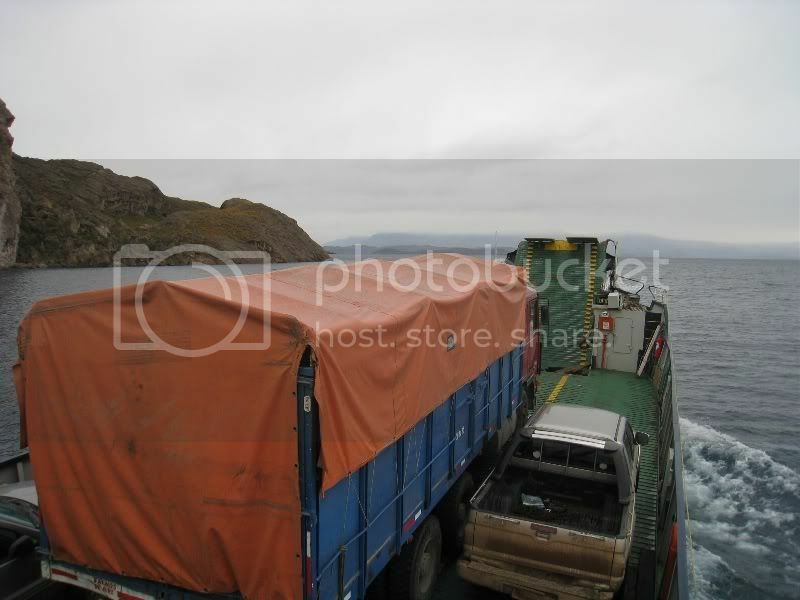 From Chile Chico we took the ferry and crossed over to Puerto Ibanez and from there we went with a minibus to Coihaique. 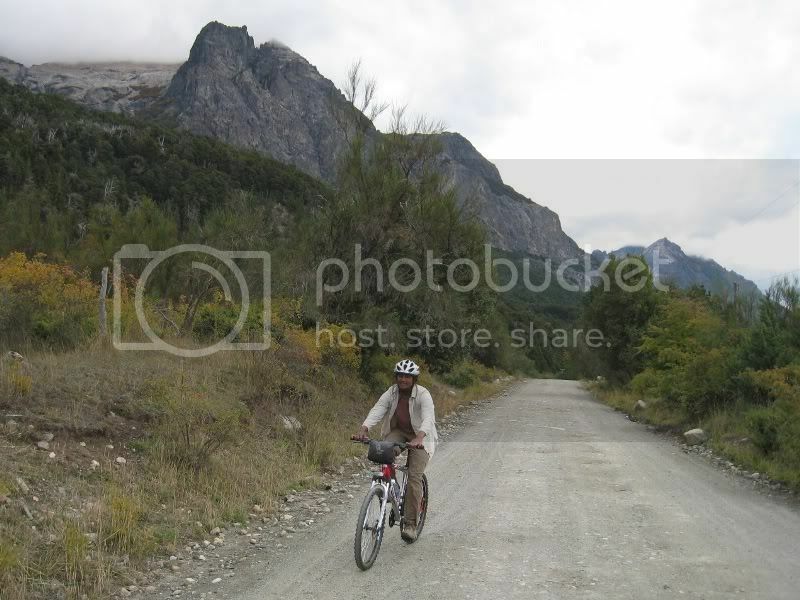 One of the problems you face if you like to experience the Carretera Austral is which mode of transport to choose. Best would be a one-way rental car, but you would have to pay some horrendous daily rental fees and a hefty one-way drop-off fee. We found another couple interested in renting a car for two days and decided to just do a small roundtrip. Later we were planning on taking buses. 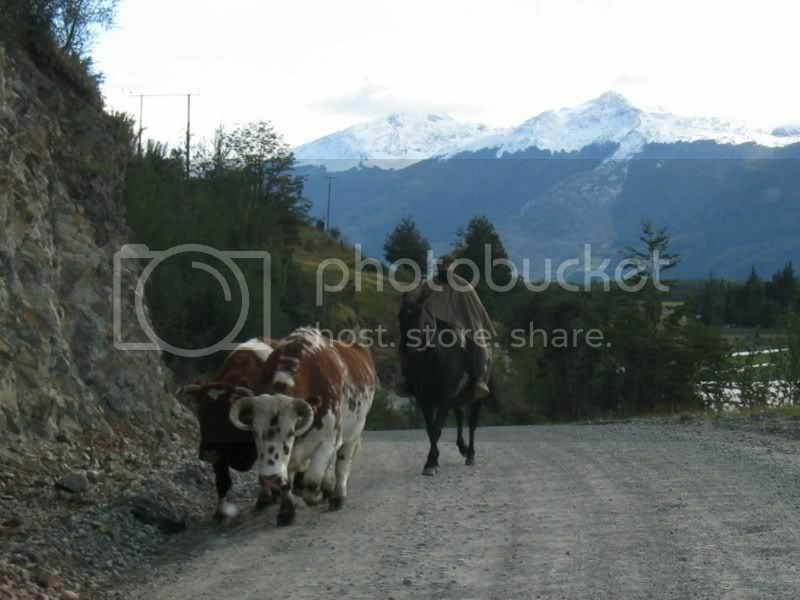 We went from Coihaique south again towards Puerto Rio Tranquilo and back-tracked some of the way we came. 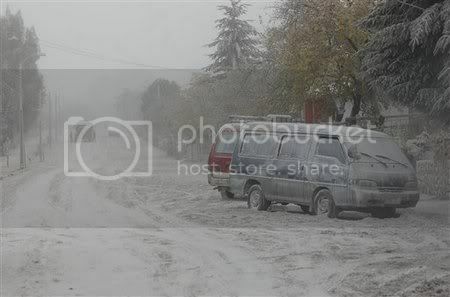 It had just snowed that night in the higher elevations. 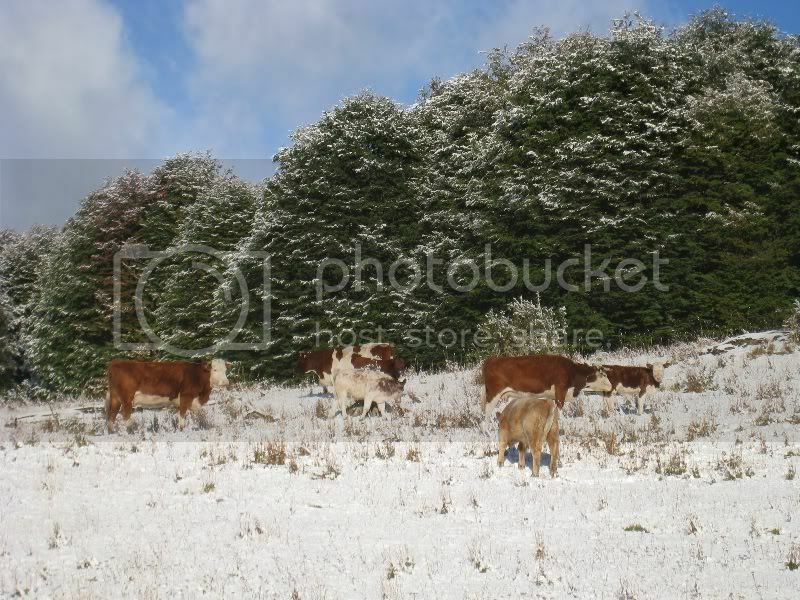 The cows were also a bit surprised to find a white blanket. 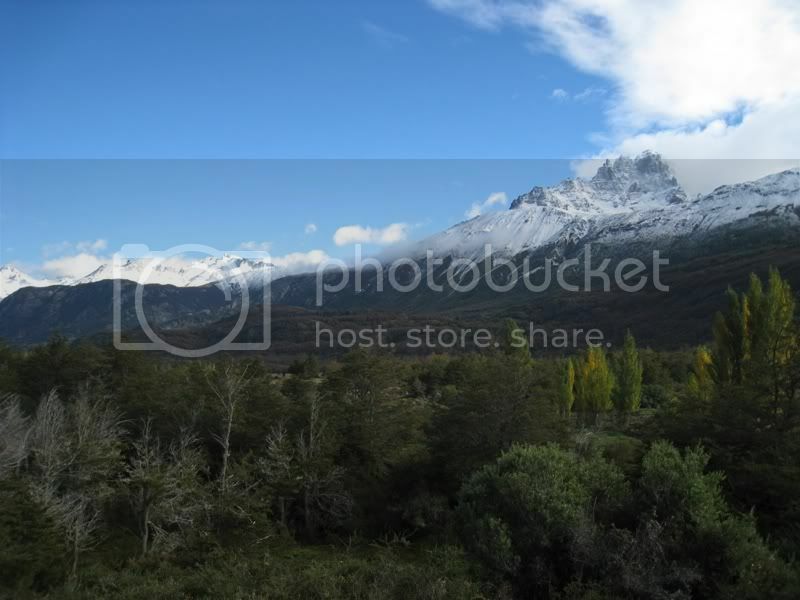 This is Cerro Castillo; the mountain that has some familiarity to a castle with several towers. 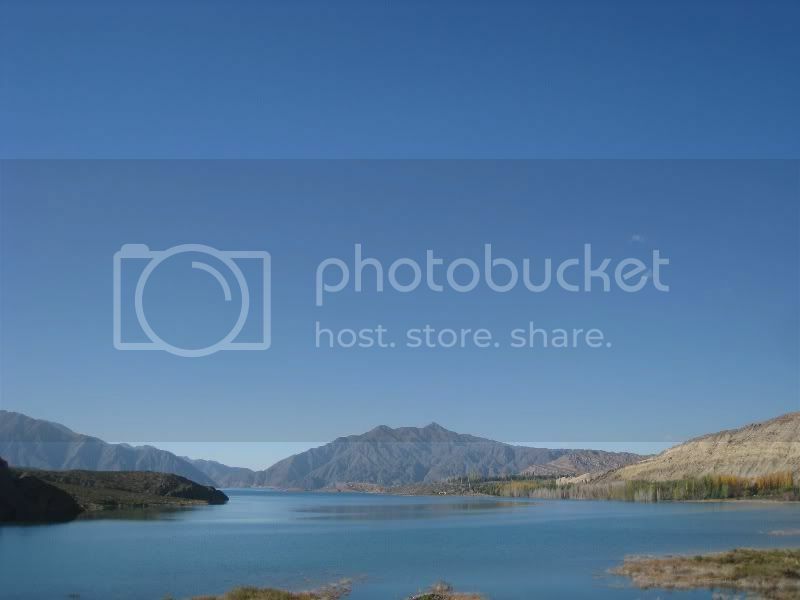 We drove for several hours south and the scenery was just breathtaking. 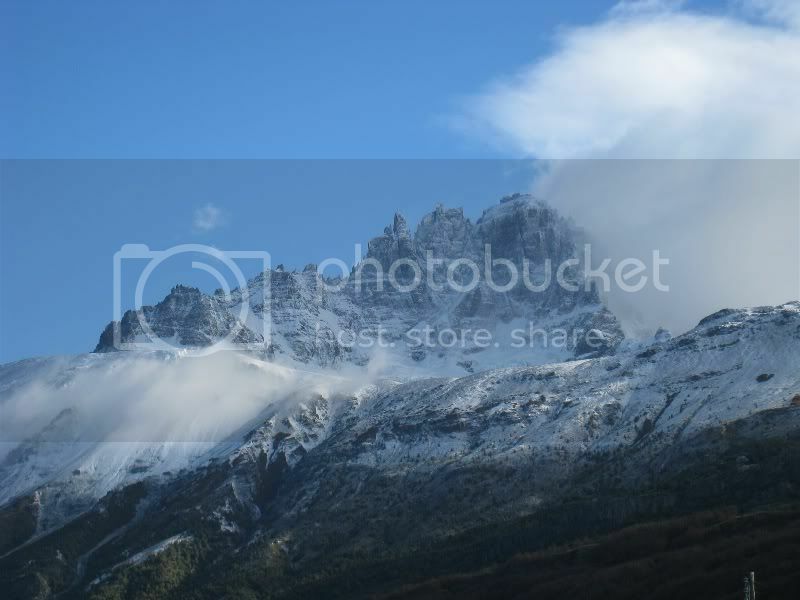 The snow capped mountain tops made it really impressive. 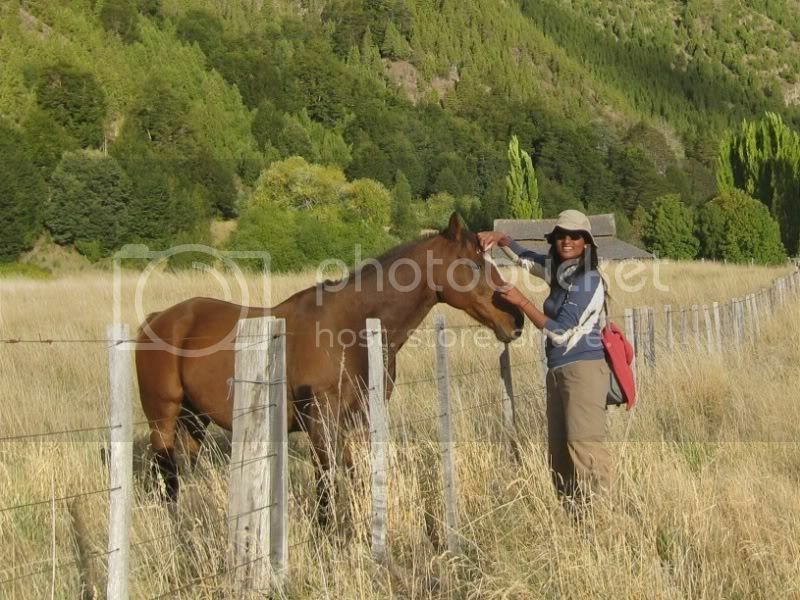 Patagonia is the land of the gauchos. 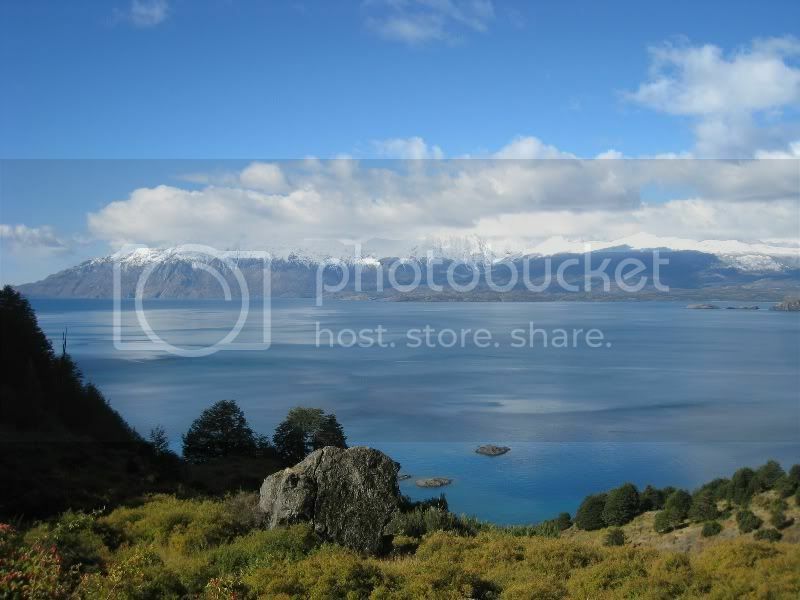 Around Lago General Carrera the mountains shot straight out of the water and create this amazing landscape. 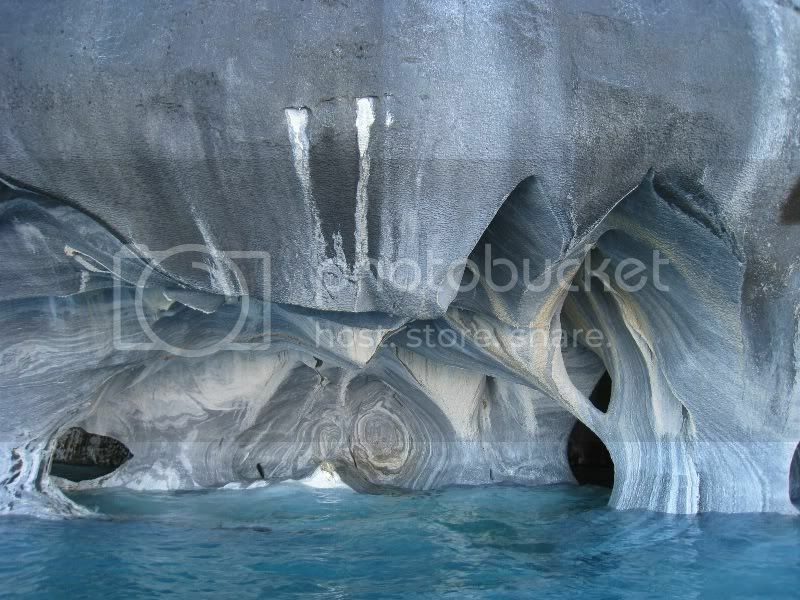 A bit south of Puerto Rio Tranquilo are the marble caves. 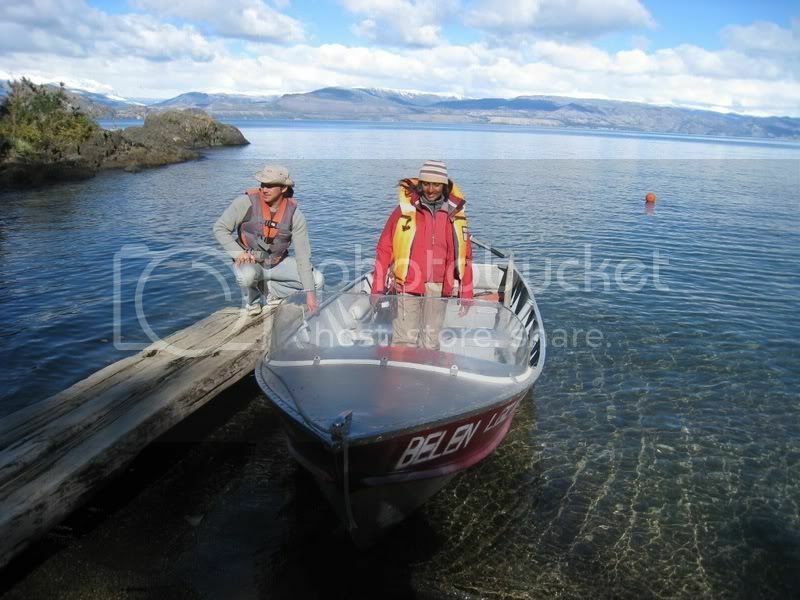 We hired a local and he took us with his boat out there. 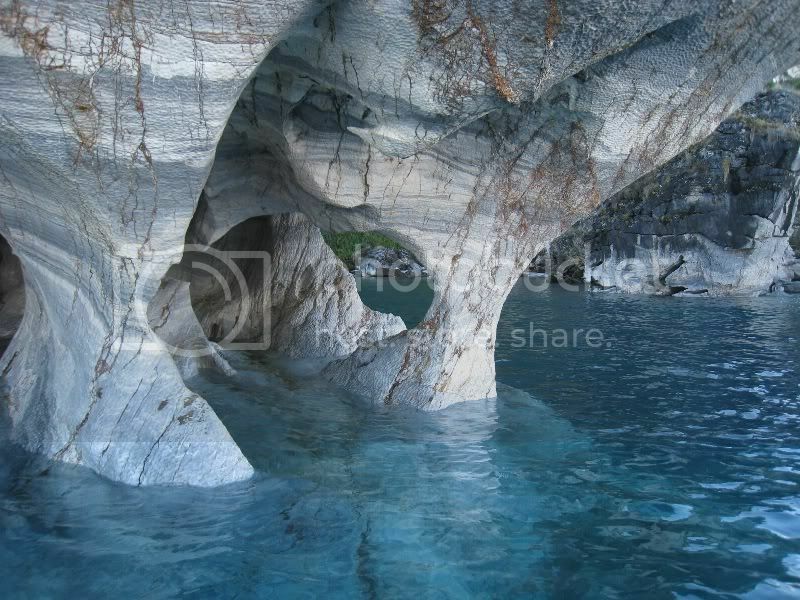 The water was amazingly clear. 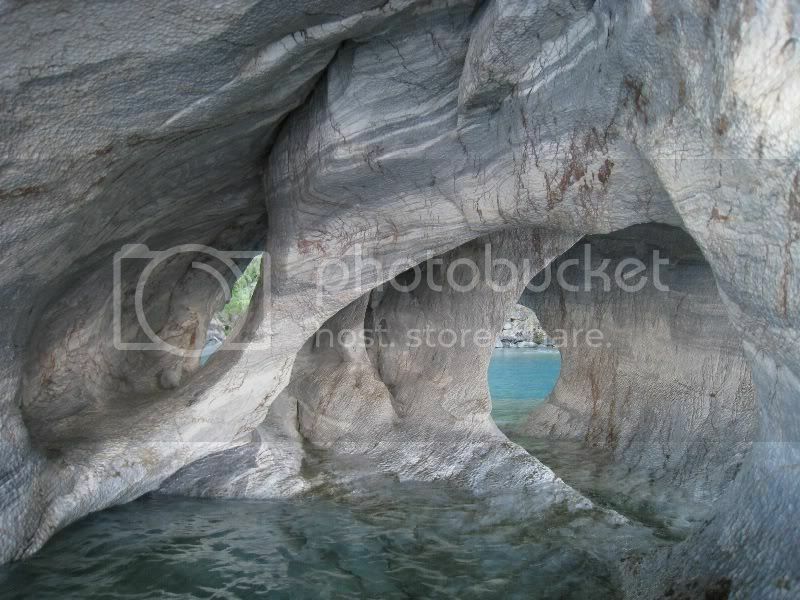 I do not think it is actual marble but this huge rock was formed by the water and made it look like marble. 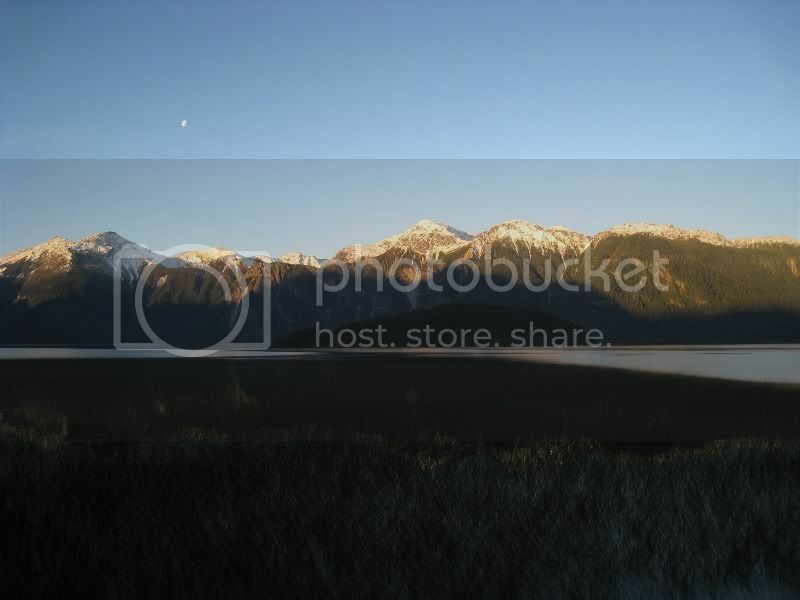 It provides some stunning views nonetheless. 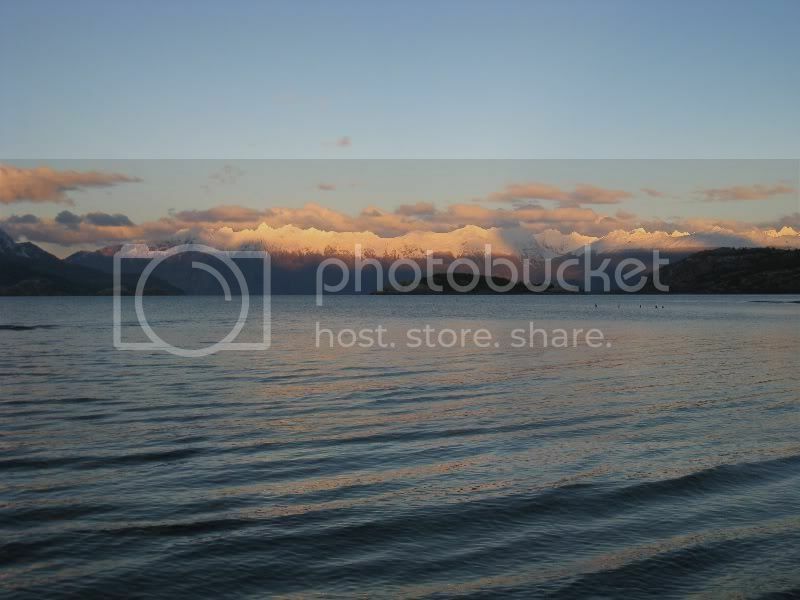 We spent the night in Puerto Rio Tranquilo and could witness another nice sunset that lit up the nearby mountains on the shore of Lago General Carrera. 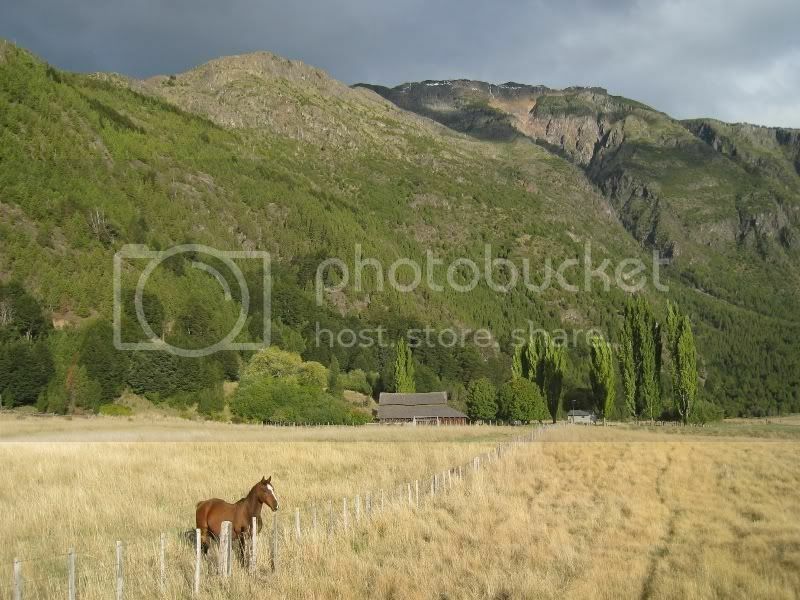 This is quite a remote area of Chile and the mode of transport is either through public buses, some beat-up old car or horses. Here we see two locals who are accompanied by a bunch of dogs. 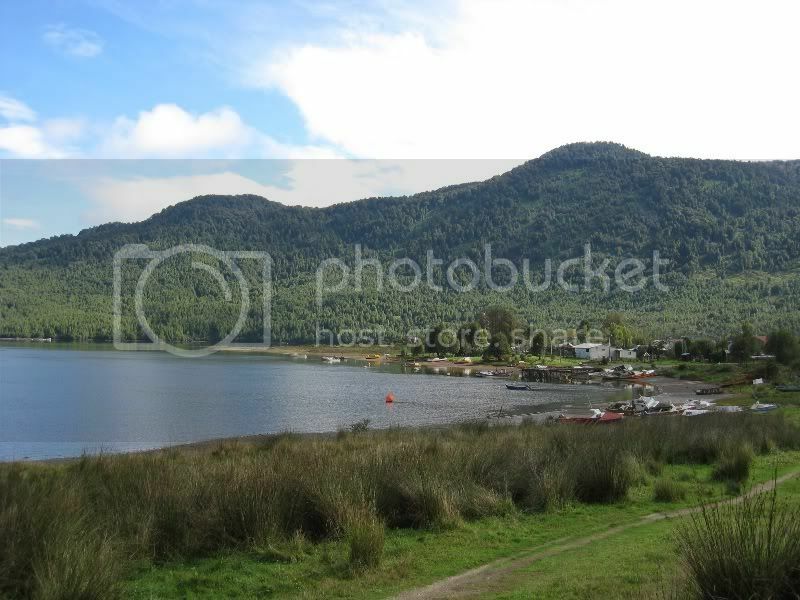 After the two day car rental we went with a bus to Puyuhuapi. 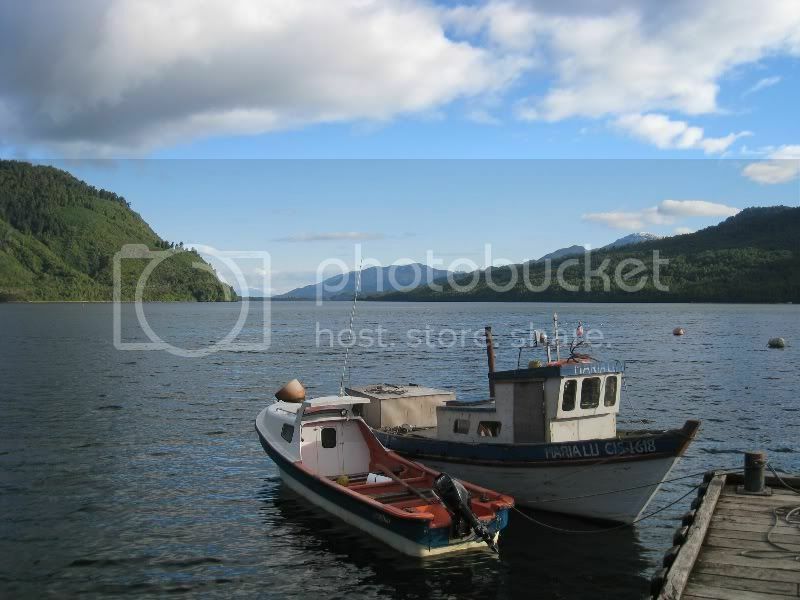 This is a tranquil fishing village at the shore of the Pacific. 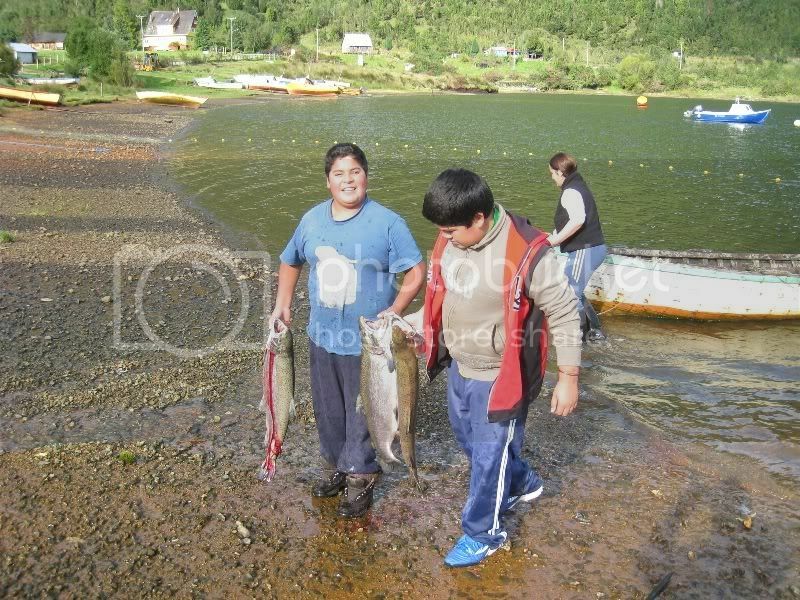 We could witness how a woman and here kids pulled some huge salmons out of the waters. Some people told us that most of those salmons escaped from the salmon farms in the fjord nearby, and that´s why they are so big. But I thought they get that large in nature also. 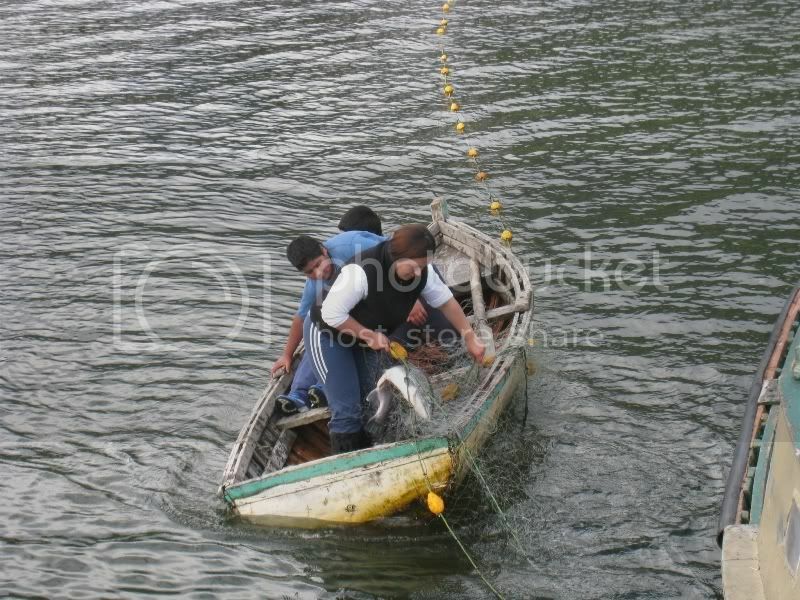 Either way... it was a spectacle to watch how the locals pulled one salmon after another out of the net. 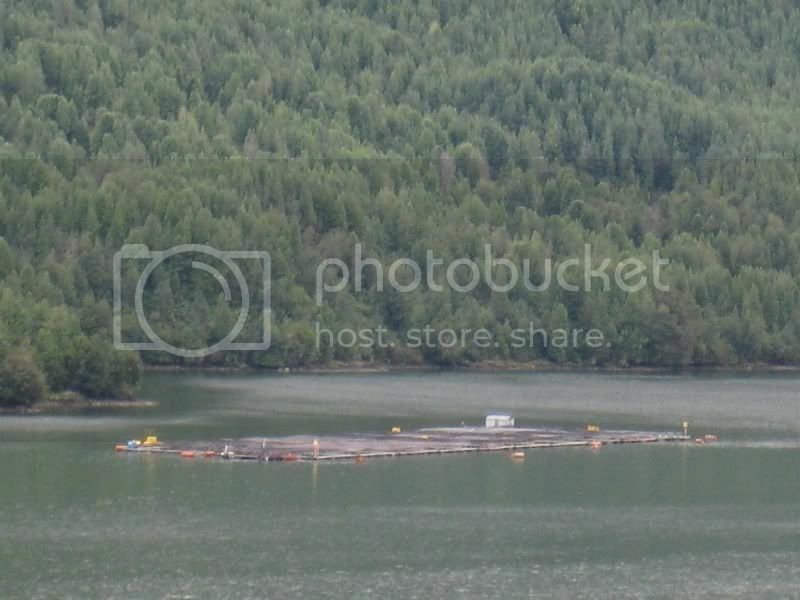 Here is one of those salmon farms. 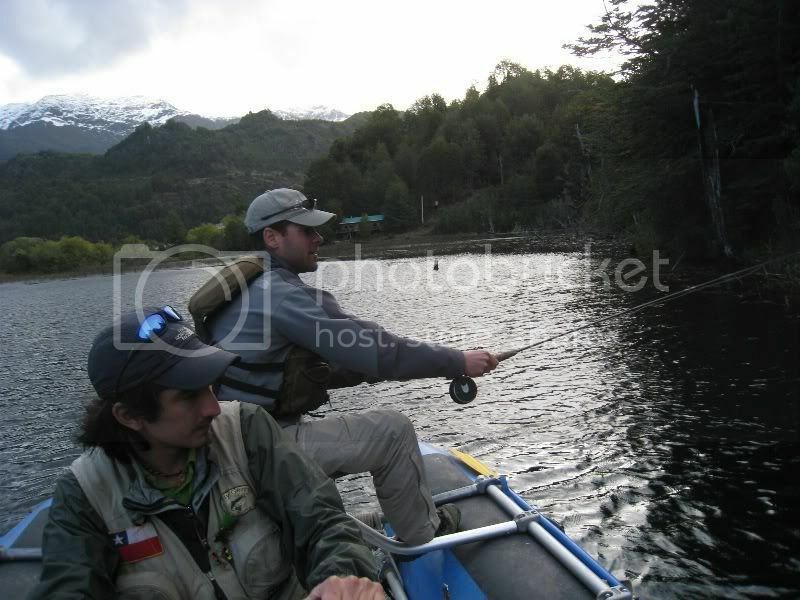 Having just witnessed what big fish are swimming around in those waters we wanted to try our luck as well. 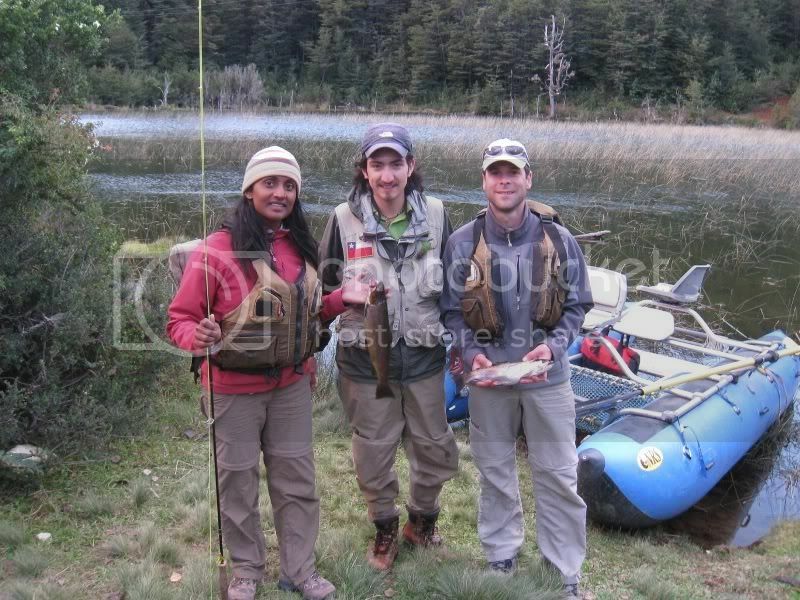 Luckily there was a local guy who Jaya befriended and let us borrow some of his fishing gear. It did not take too long and Jaya had one already on the hook. 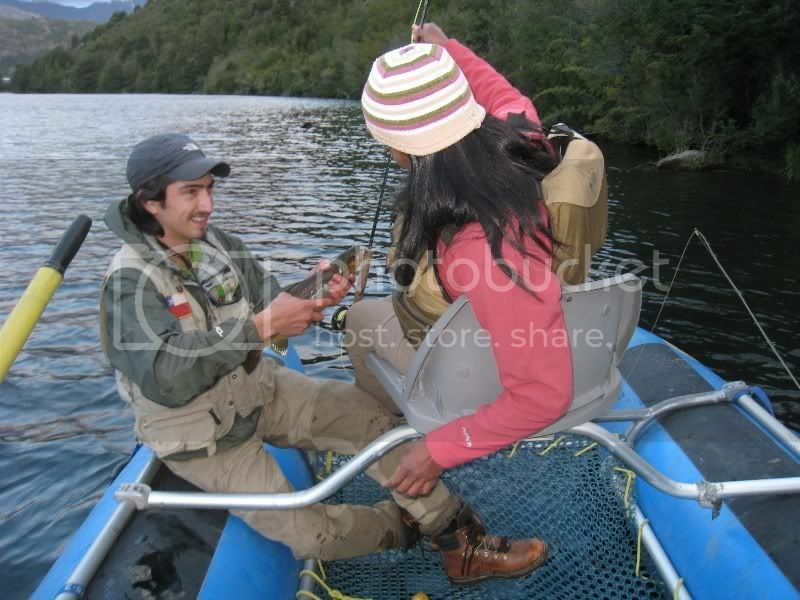 Even without a proper fishing rod, just with the simple line it worked. 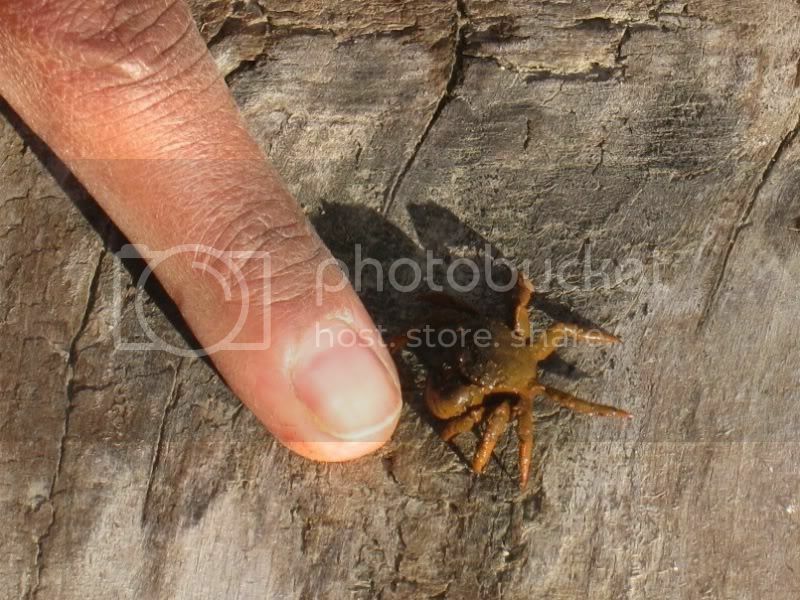 A tiny little crab wanted to play with us as well. 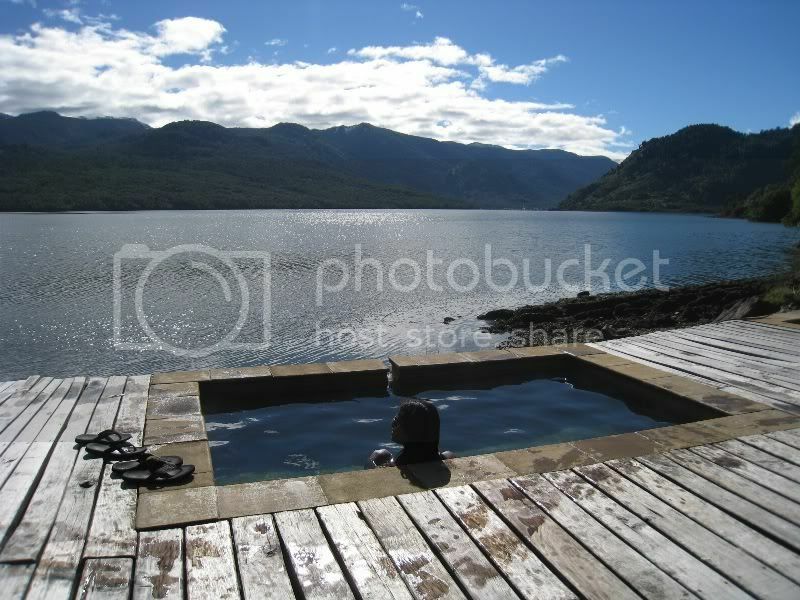 There are also some thermal springs nearby and one day we just relaxed and soaked in the hot waters overlooking the fjord. 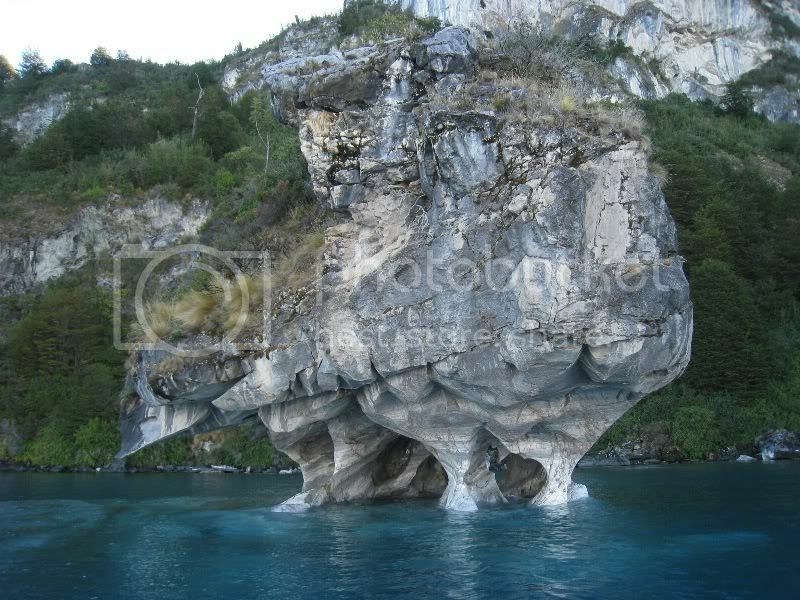 The low season in Patagonia starts in April and the buses do not run every day anymore on the Carretera Austral. 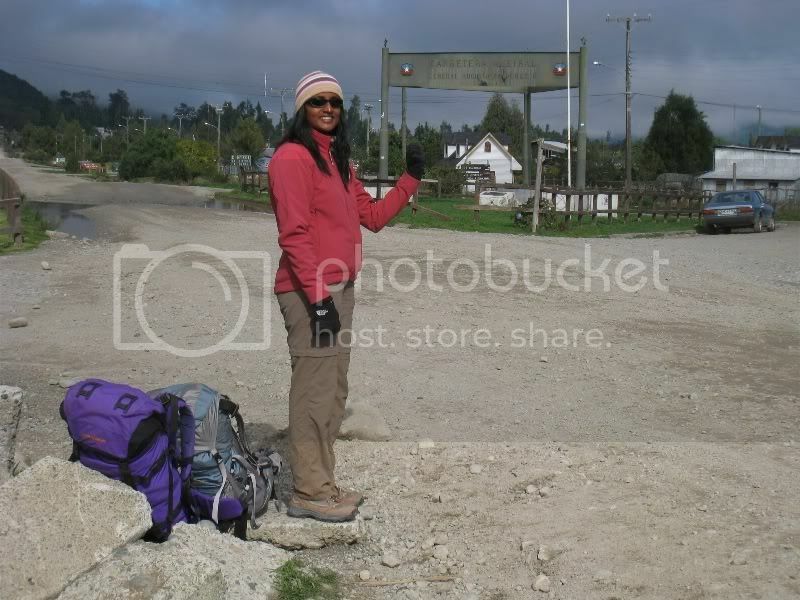 Instead of waiting around another 2 days for a bus we decided to try our luck with hitch-hiking. There is only very little traffic on the road and it took us more than 2 hours to get a lift for the first 50 kilometers. There we got stuck again for 4 hours and nobody came by to take us along. Good thing there are always some dogs around here in South America and it takes very little to make a few friends, which give you company for a few hours. We did not have much luck waiting around in town and decided to hike a bit north and came along this little suspension bridge. North of the bridge in the middle of nowhere we sat down and hoped that at least here somebody is going to feel sorry for us. 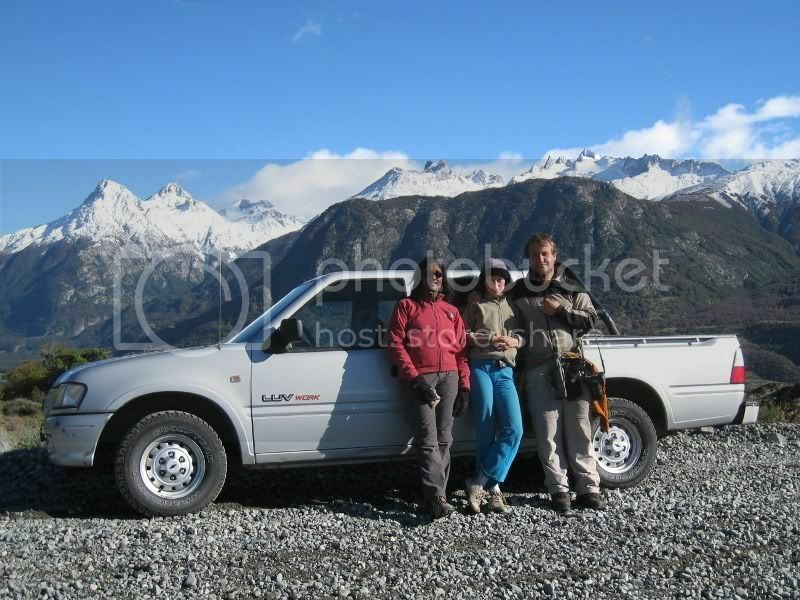 Luckily the tactic worked out and a German couple in a rental car took us along all the way to Futaleufu. We could enjoy some great evening light during that ride. 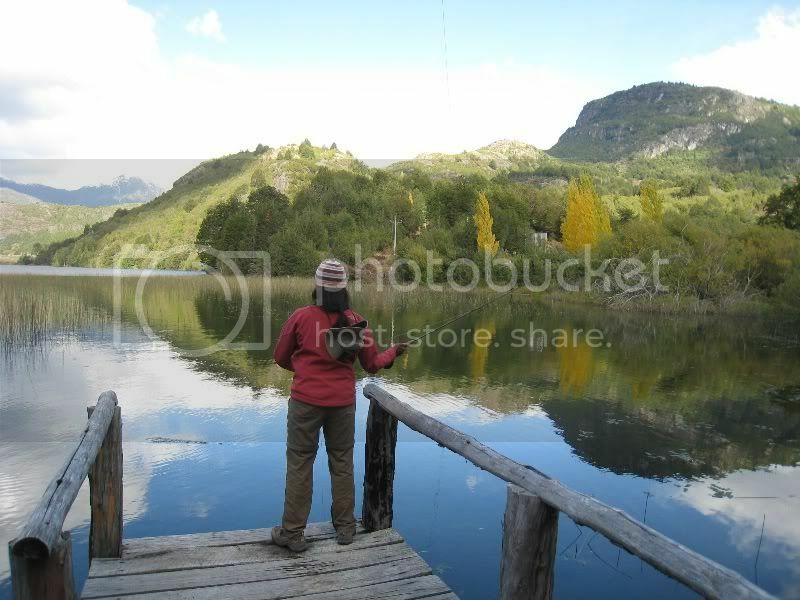 Next day we went for a hike around Futaleufu. 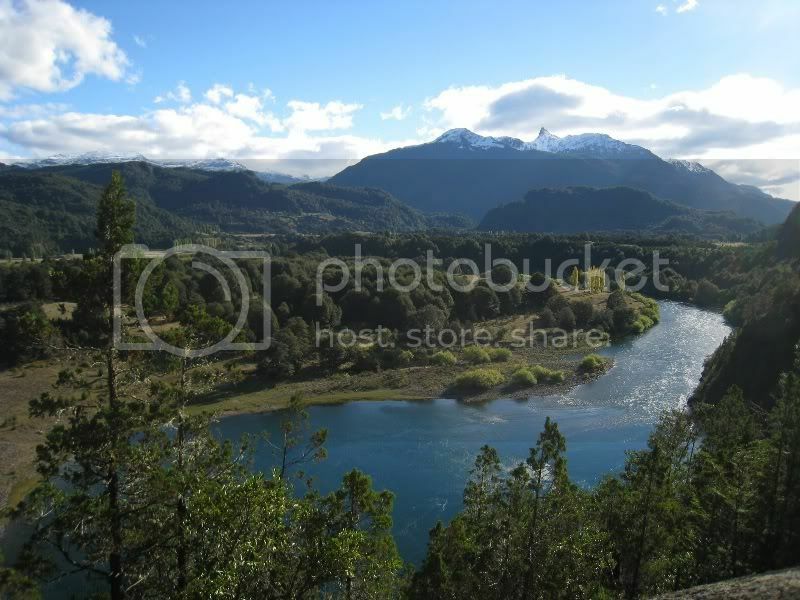 Here we hiked along the Rio Futaleufu. 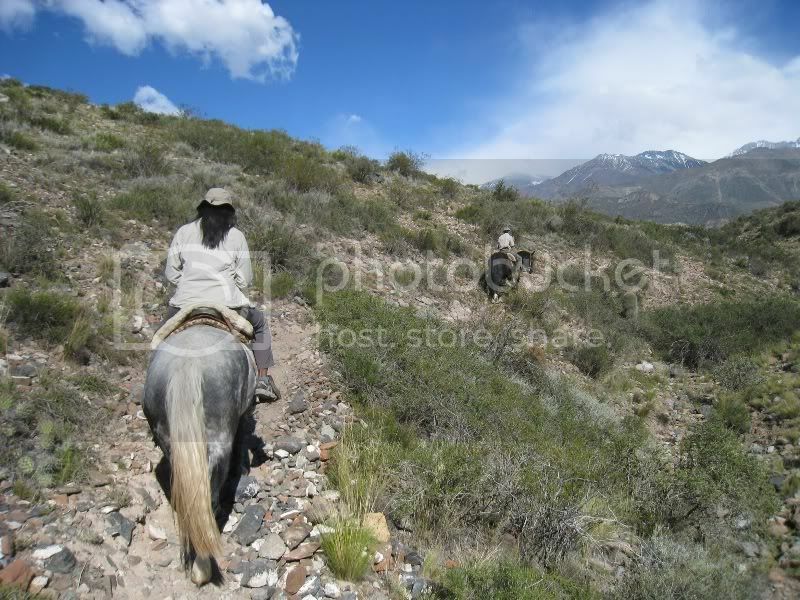 We crossed through the land of a nice estancia. This fellow liked to get some attention. 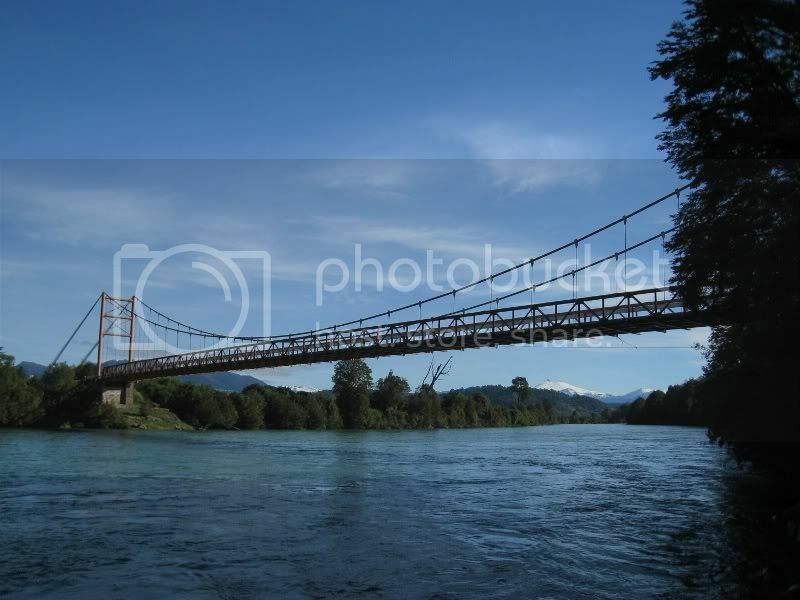 Futaleufu is well know for its world class river rafting. 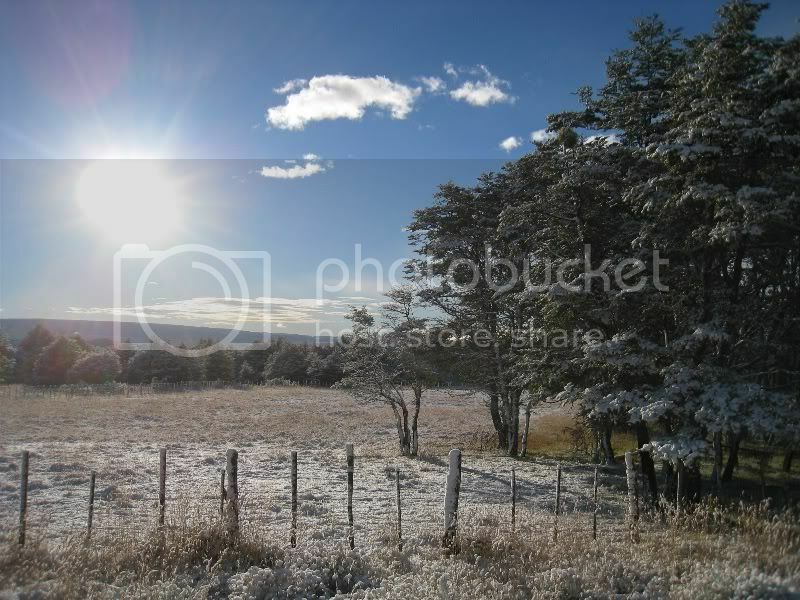 But the season was practically over and the temperatures were not very inviting. So we decided to rather try out fly fishing. 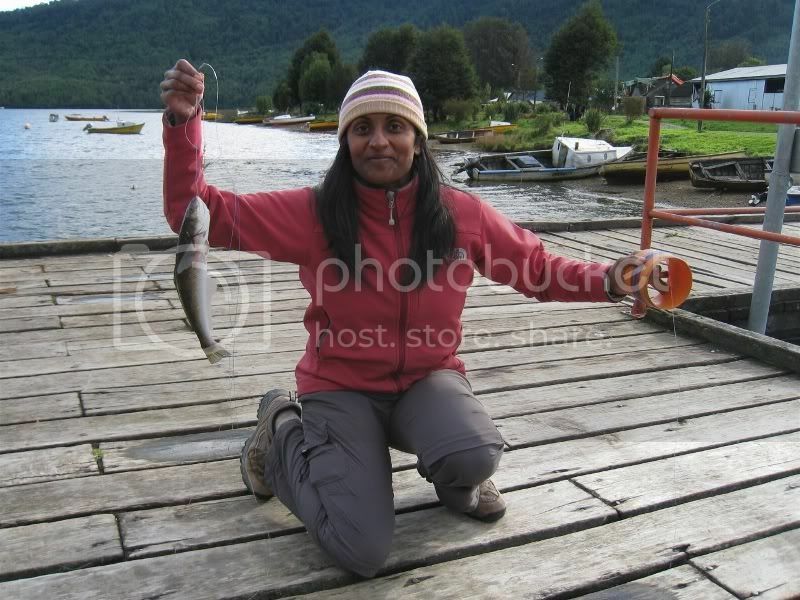 Here Jaya is practicing the casting. After we figured out the moves we went with the guide and his boat out on the lake. 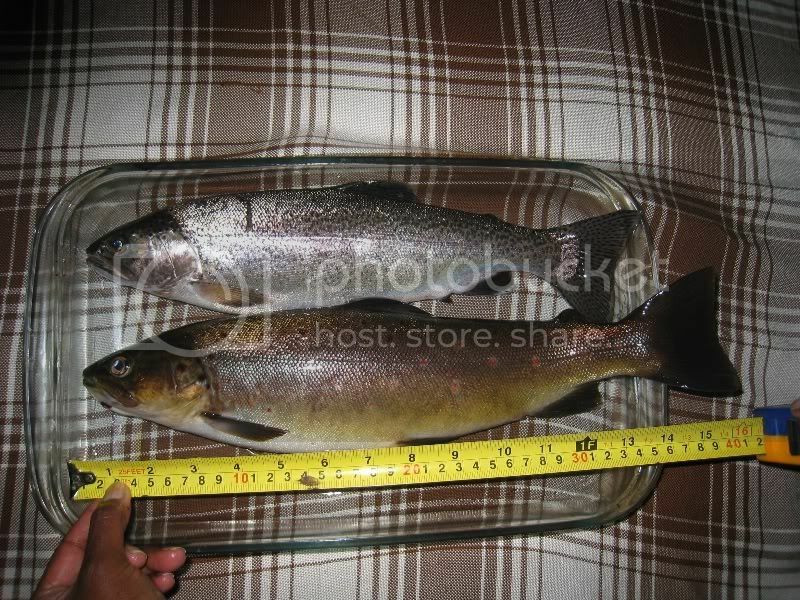 Jaya landed a very nice sized trout. Happy group at the end of the day. 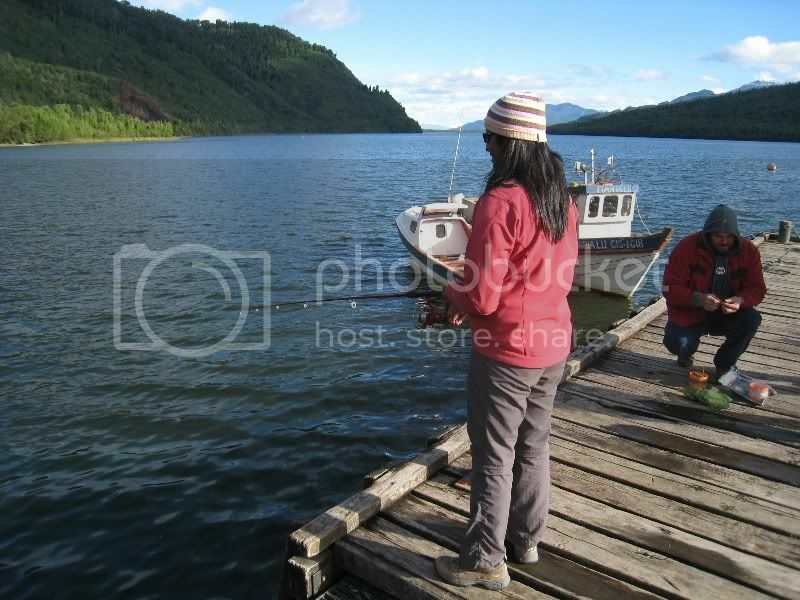 We were in Futaleufu just 2 weeks before the following pictures went around the world. 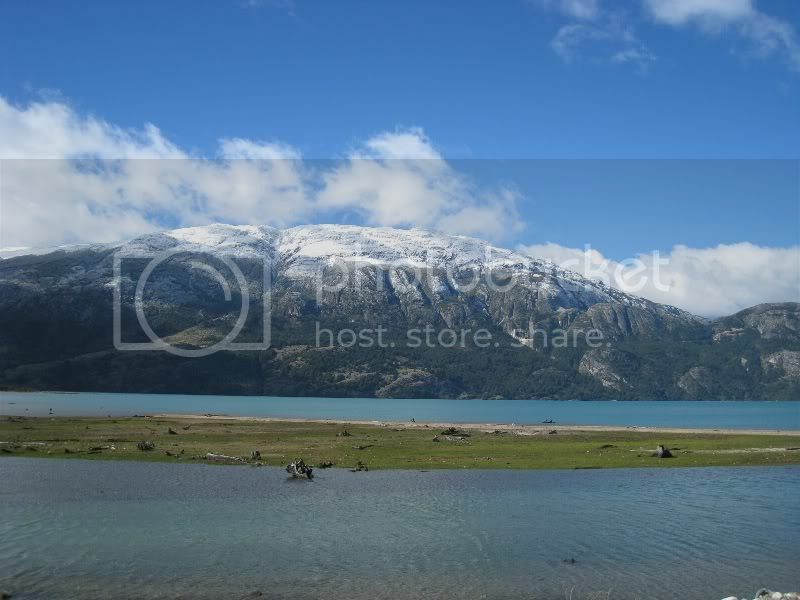 The long-dormant Chaiten volcano is about 60 kilometers away from Futaleufu and started on May 1 to blast ashes in the sky, forcing the evacuation of tousands. It covered large parts under a thick coat of ash. We highly regret to hear this news, since it will cause lots of hardship to the local people and it is a beautiful area. We hope they can recover from this in the near future. 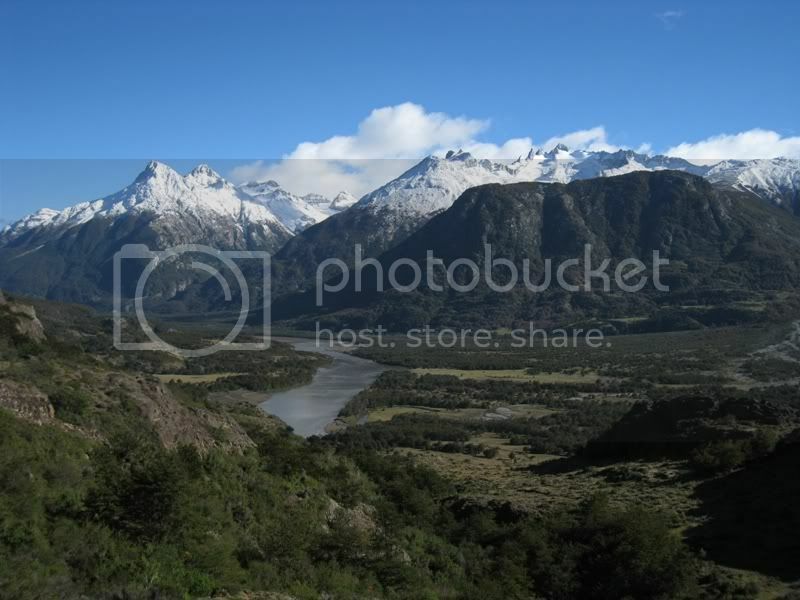 Futaleufu is close to the border and we decided to hike the next morning early to the border to cross back into Argentina. I mentioned already the dogs before. 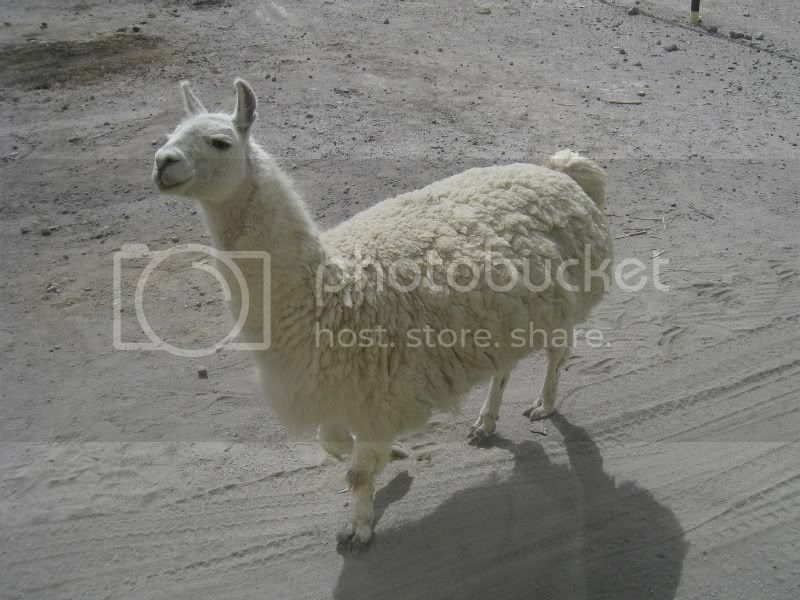 You basically pet a dog once or give them a bit of food when they stray around and they will follow you for a while. 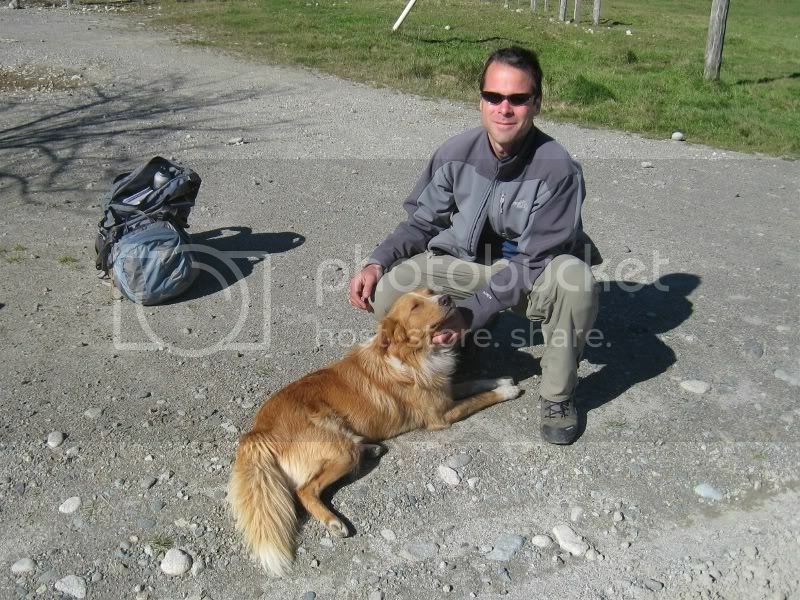 Here we did not even pay any attention to this dog, but he just decided to accompany us. 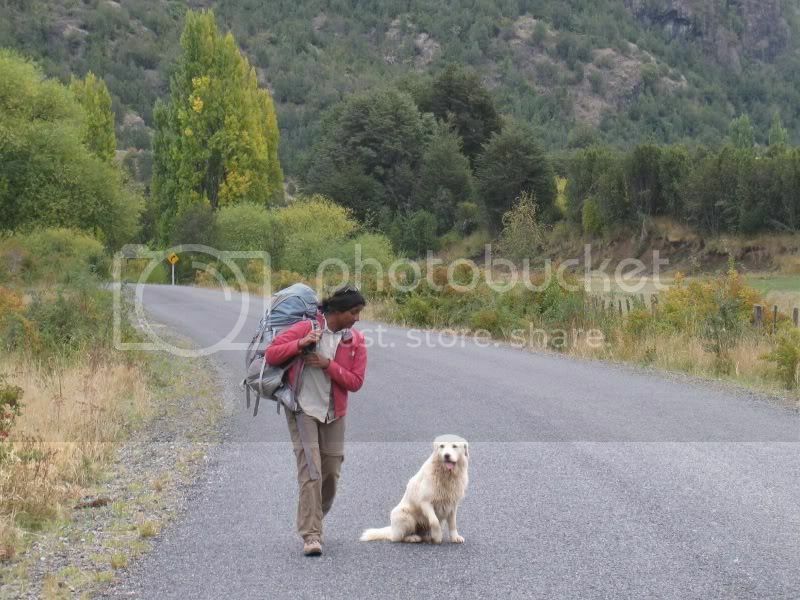 It took us several tries to make this dog clear that we could not take him along across the border. 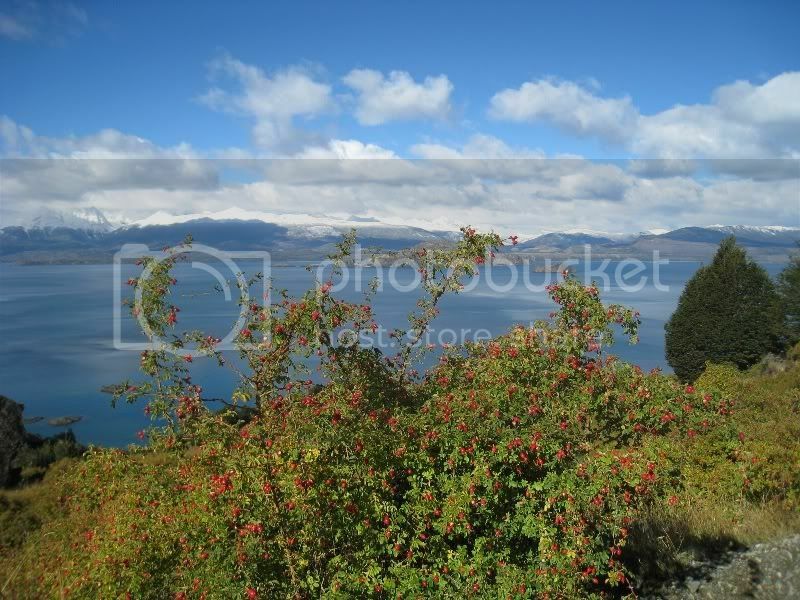 Another two hitch-hiking lifts and a bus ride later we arrived in Bariloche. We rented some bikes and did the Circuito Chico ride. 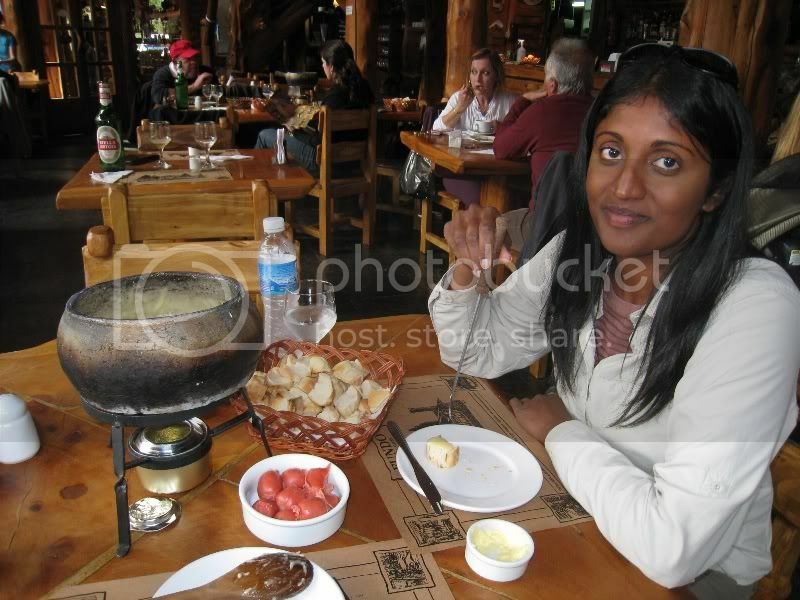 There is a small "Swiss" village called "Colonia Suiza" and we enjoyed a pretty good cheese fondue for lunch. 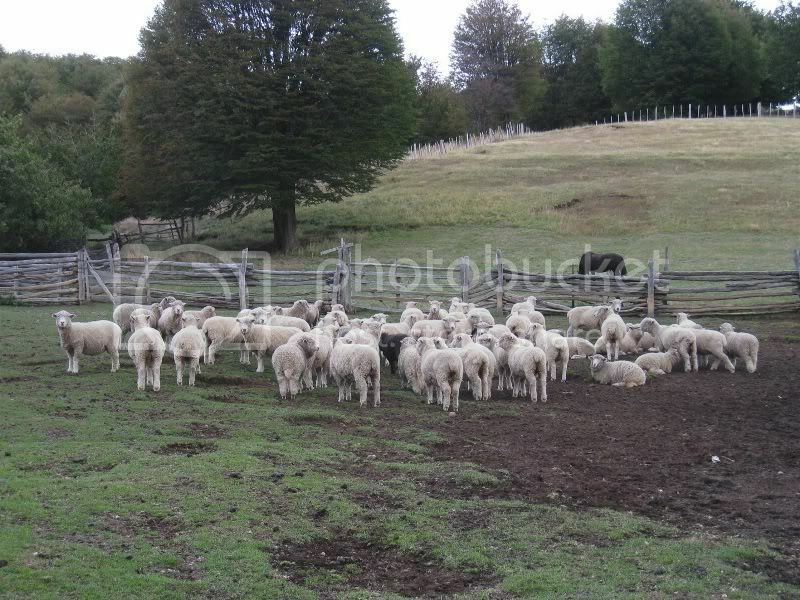 Patagonia is also the land of the sheep and you can see them almost anywhere. 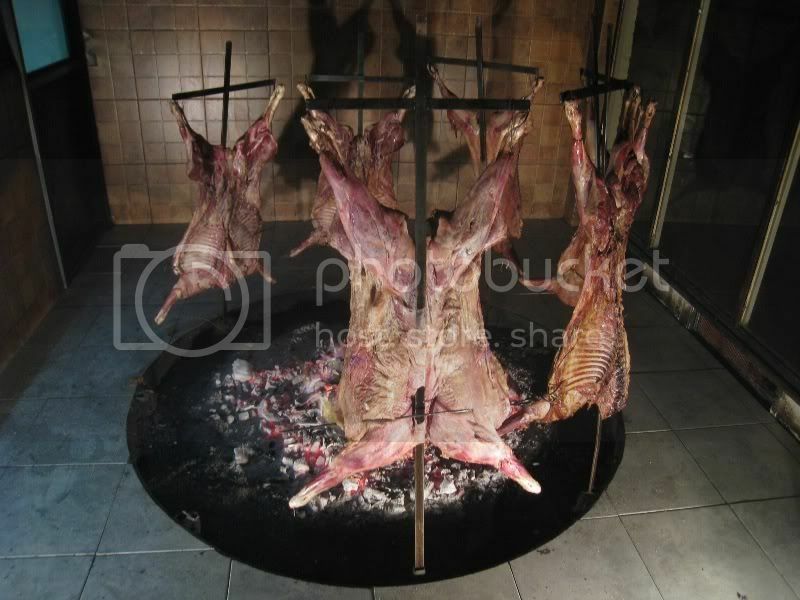 The gauchos also perfected how to grill the lambs over the open fire. Finally in Bariloche we tried the "cordero asado"(=grilled lamb) and it tasted great! 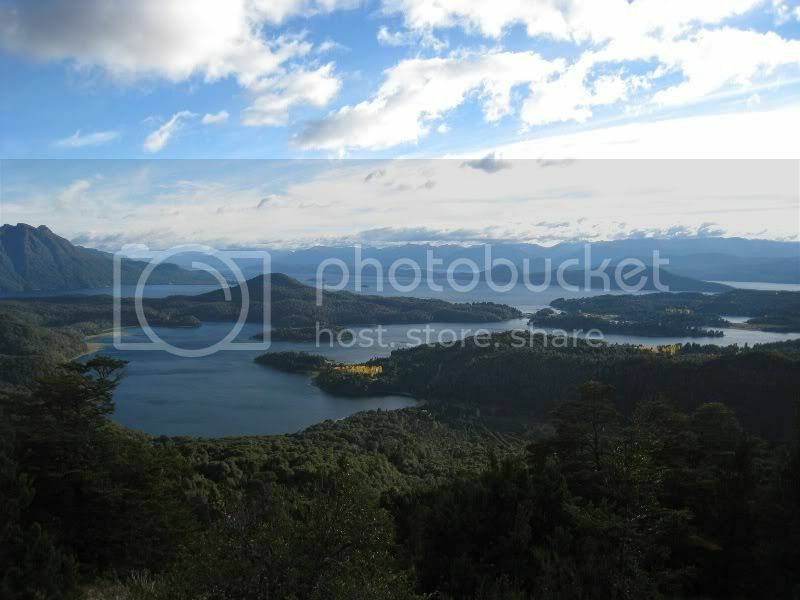 One day we hiked up to Cerro Lopez to get a better overview of the Lake region. The fall colors in full blossom. 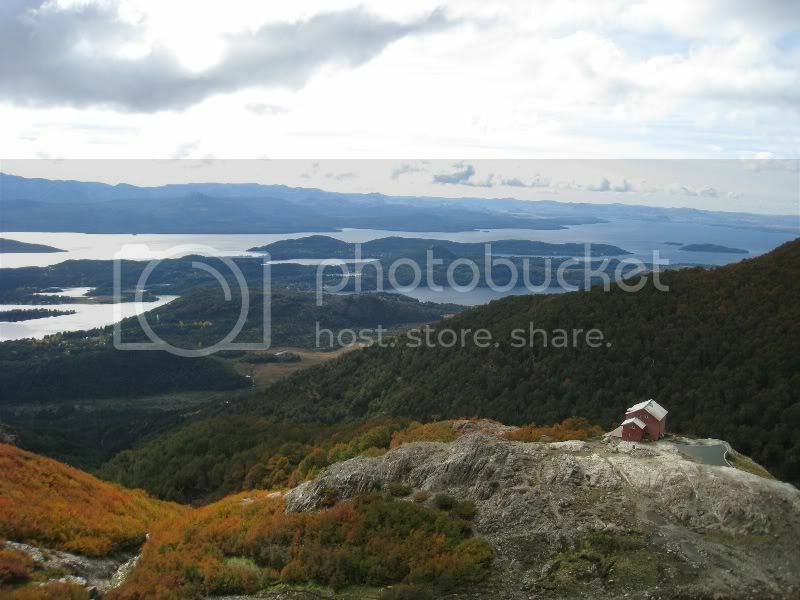 View towards Bariloche with refugio Lopez in the foreground. 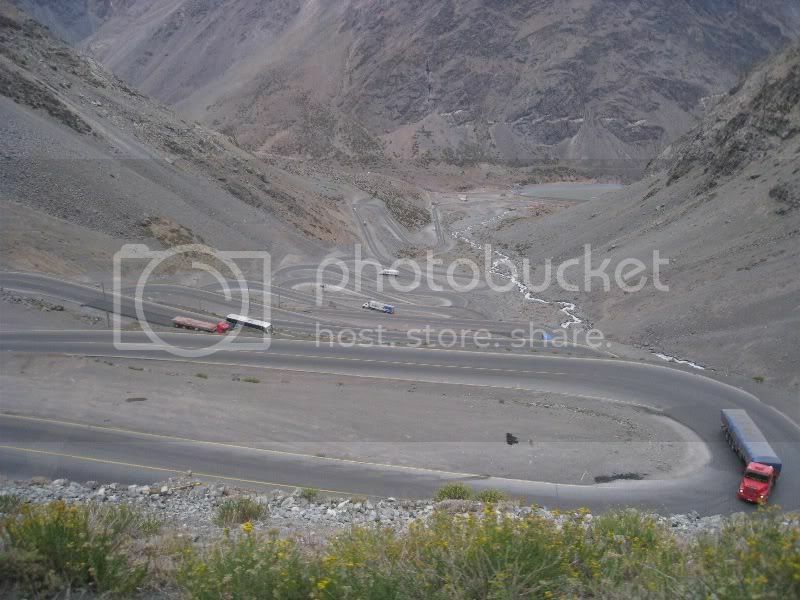 After Bariloche we headed north to Mendoza. 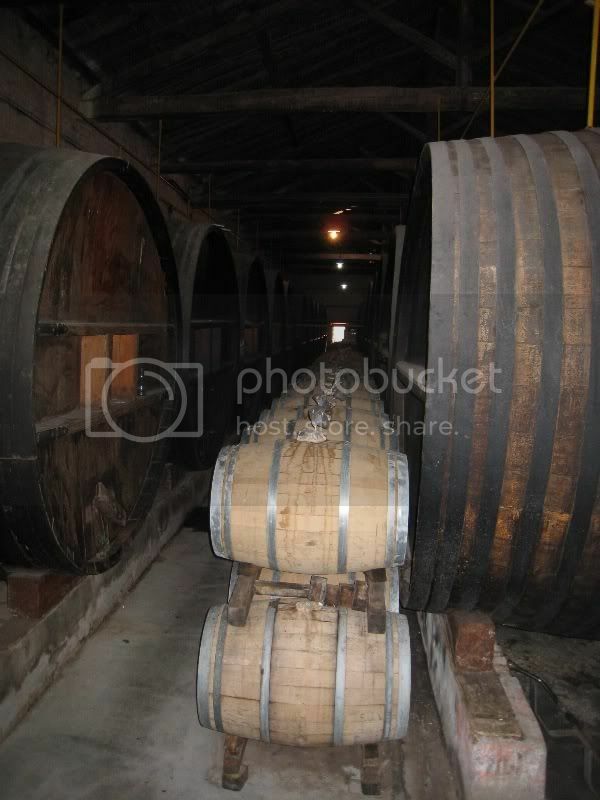 I will post some pictures about our stay in the wine country in a separate post. And here again our route.